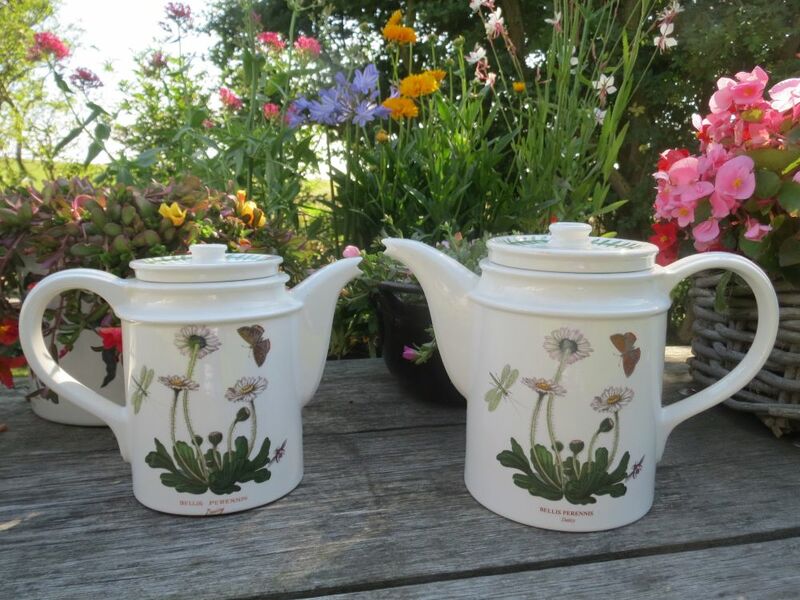 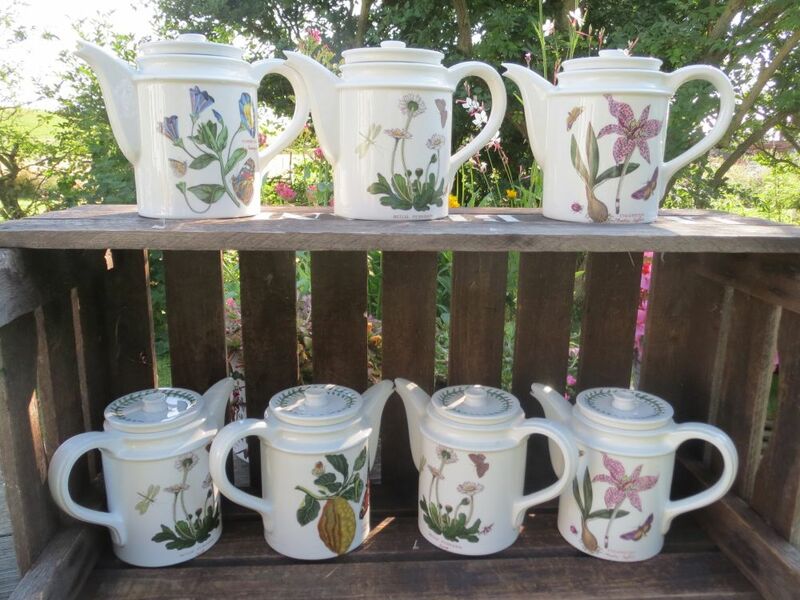 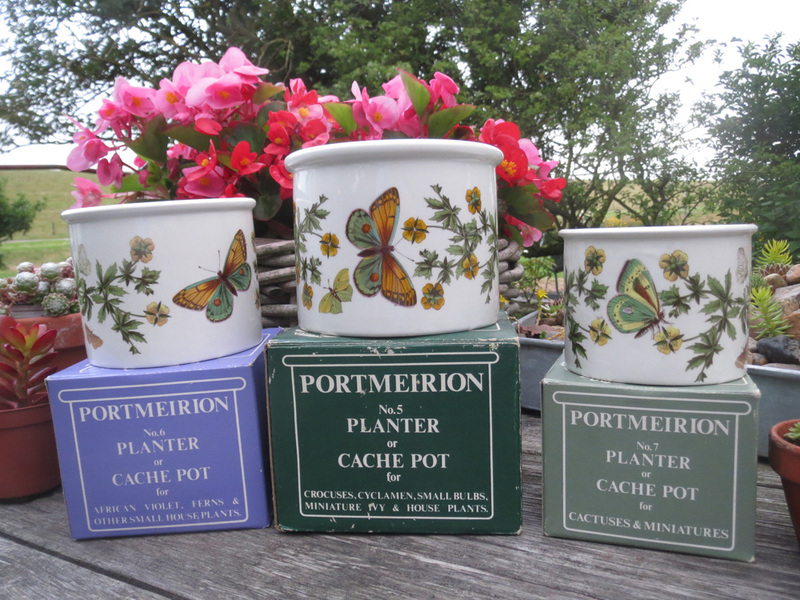 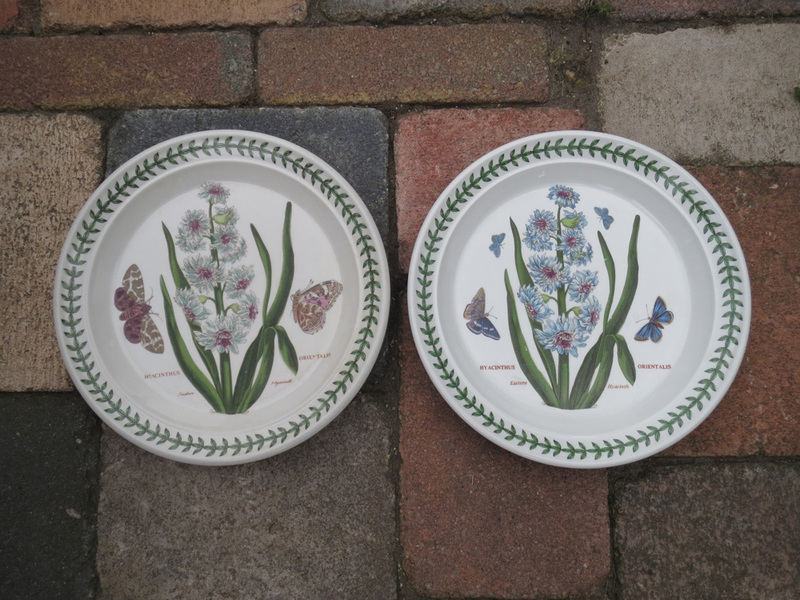 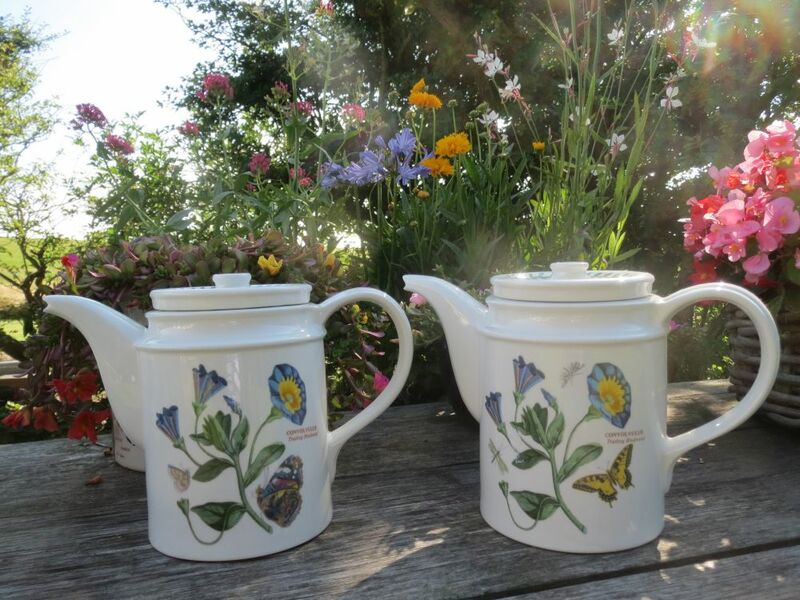 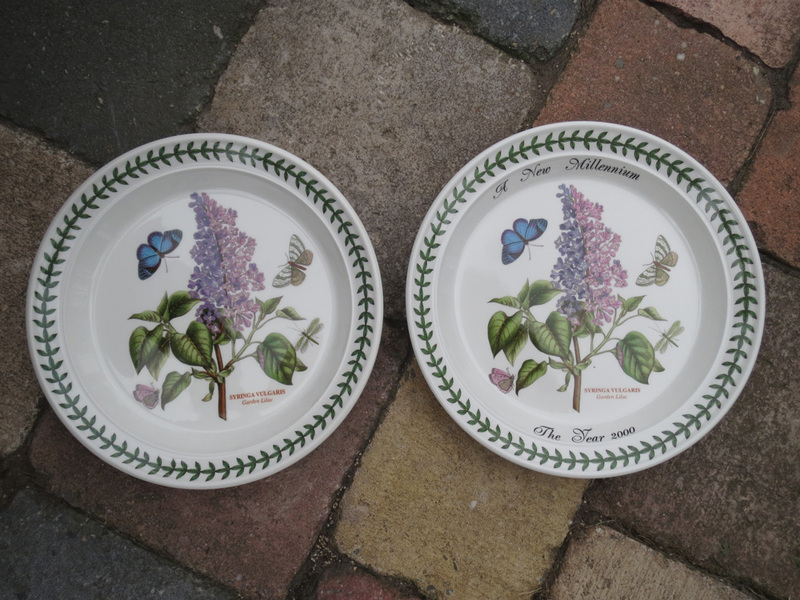 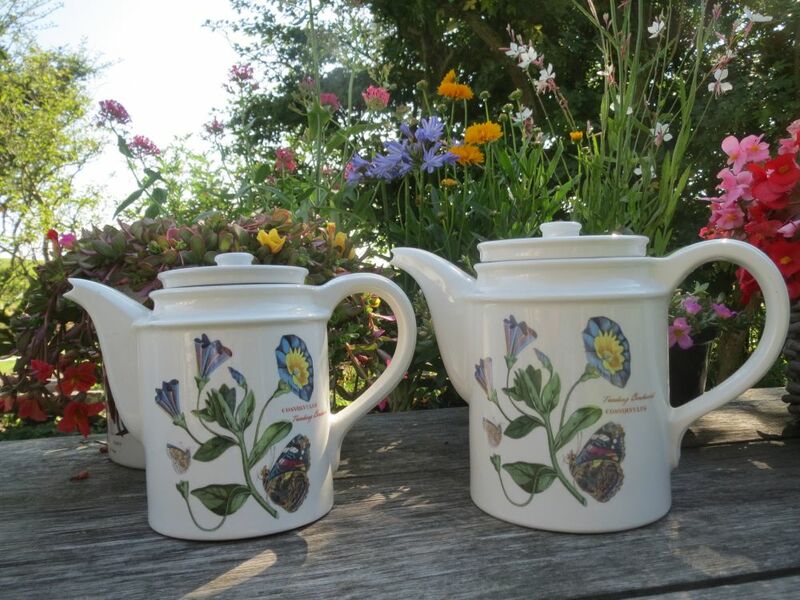 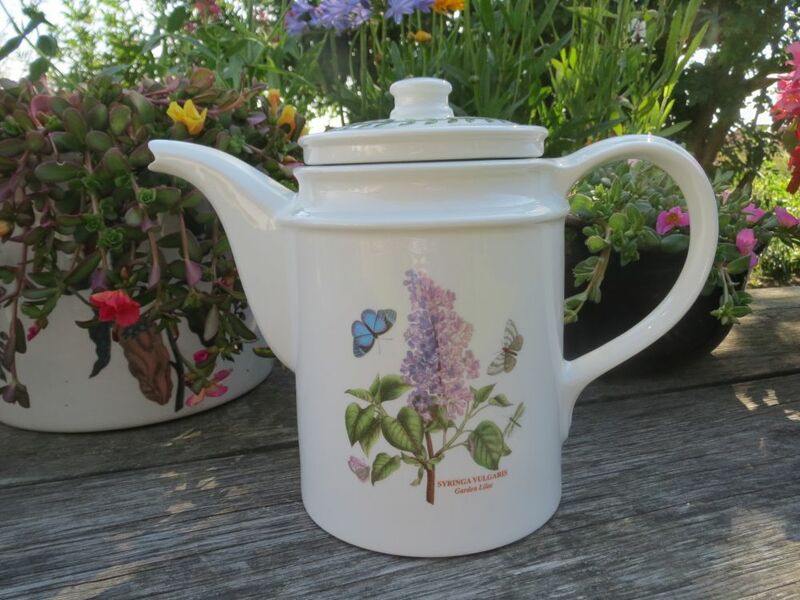 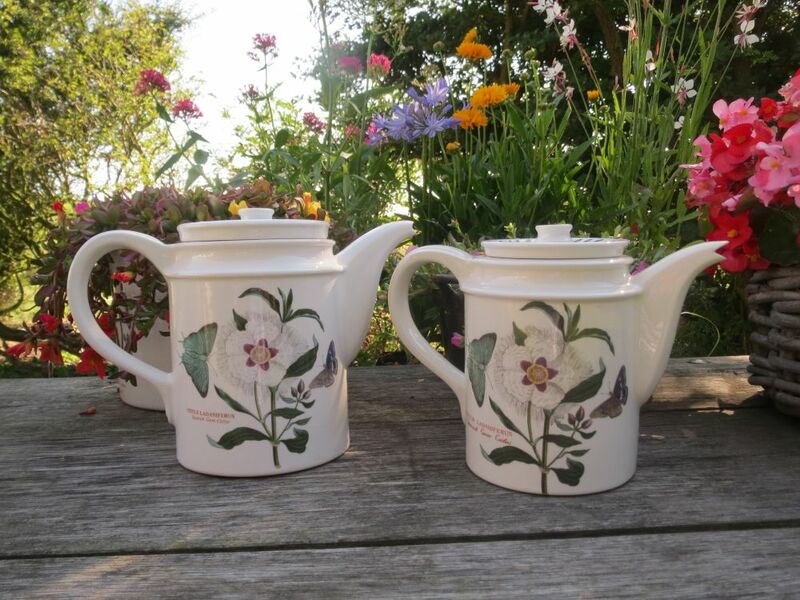 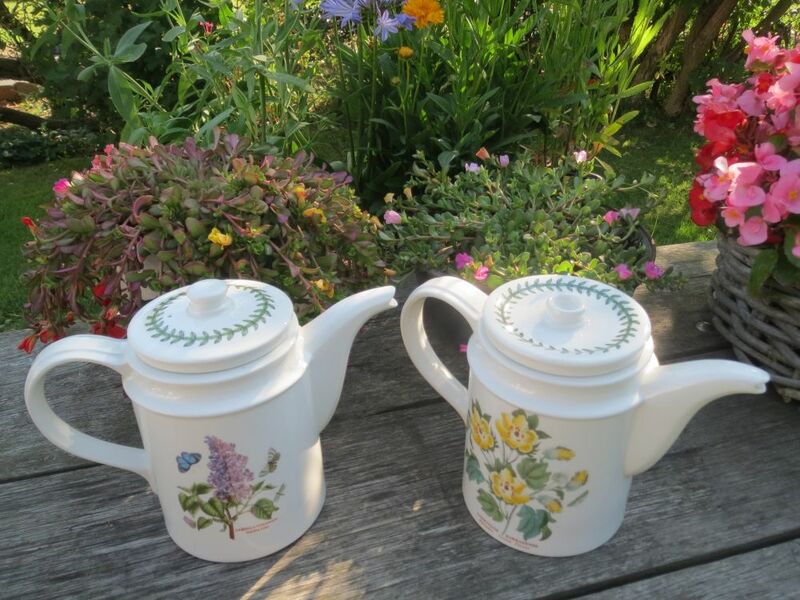 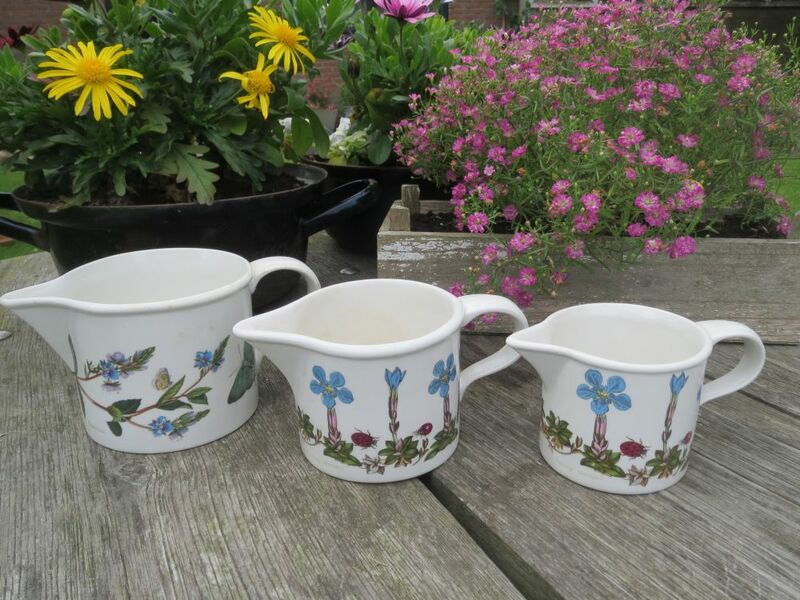 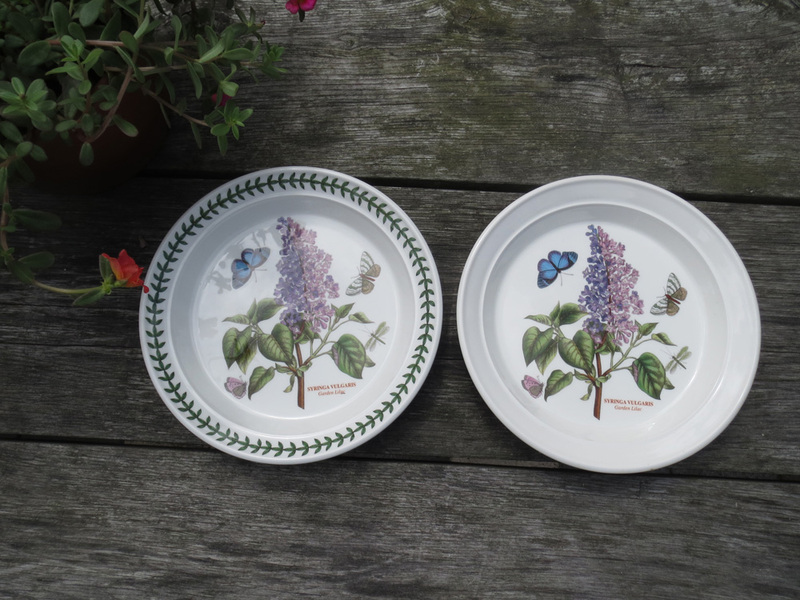 These have the Forget Me Not, the Rhododendron and the Speedwell. 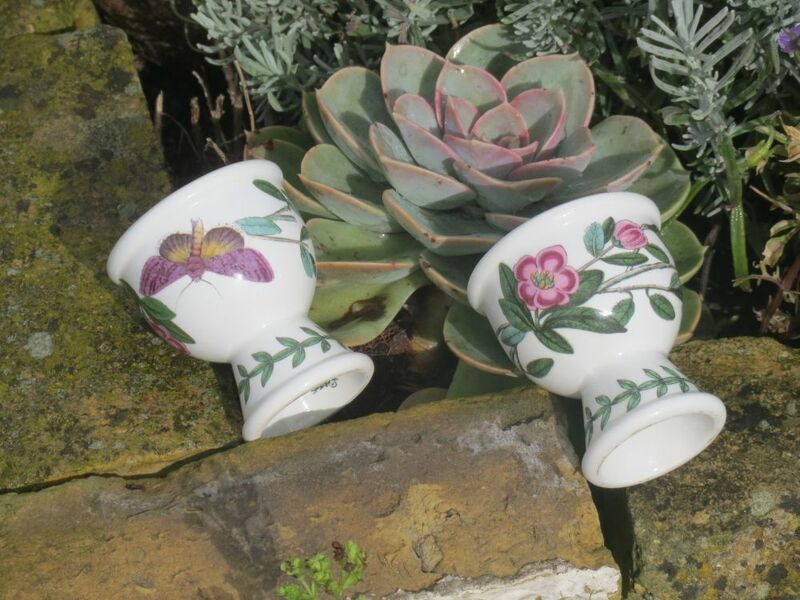 Thet are the Ivy Leafed Cyclamen, the Orchid, the Purple Iris, the Canterbury Bells, the Barbados Cotton Flower and the Orange Cactus. 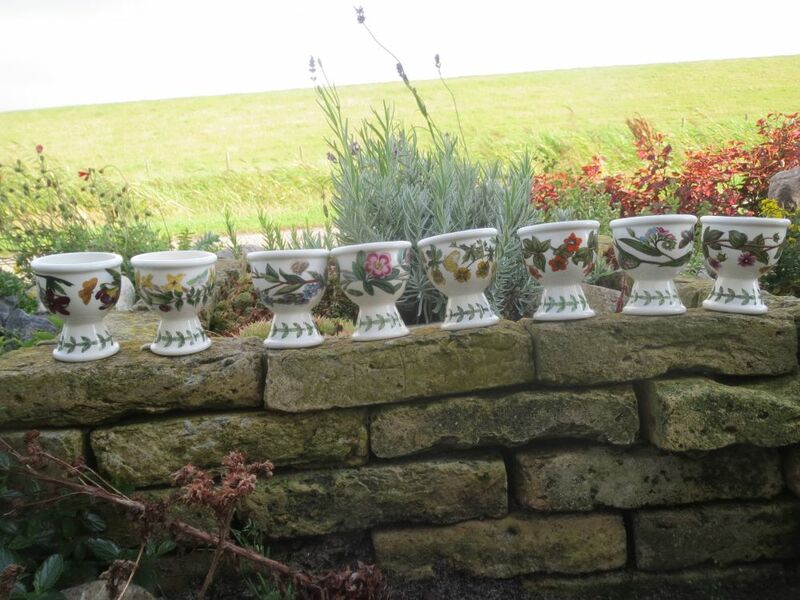 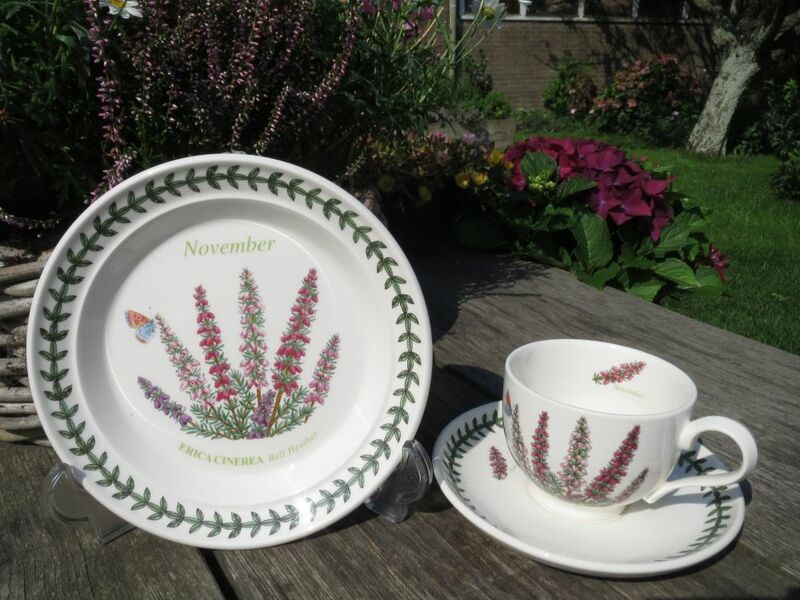 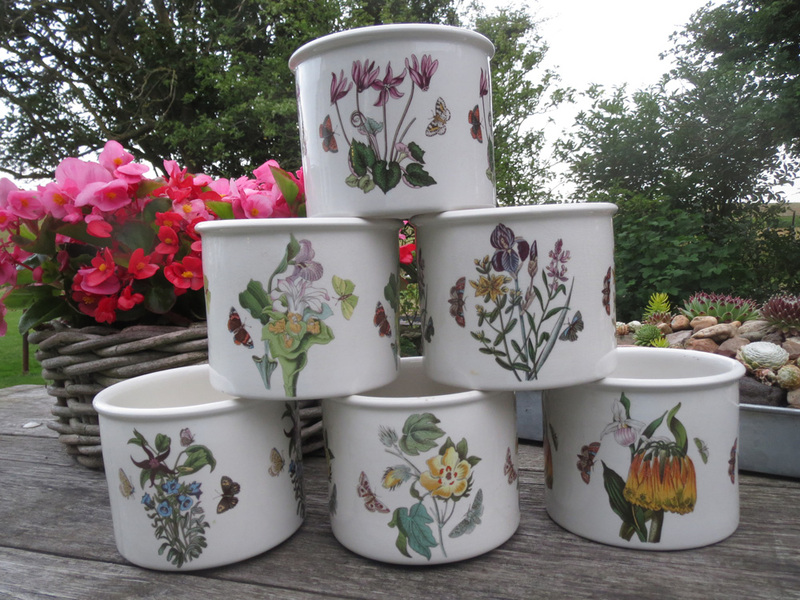 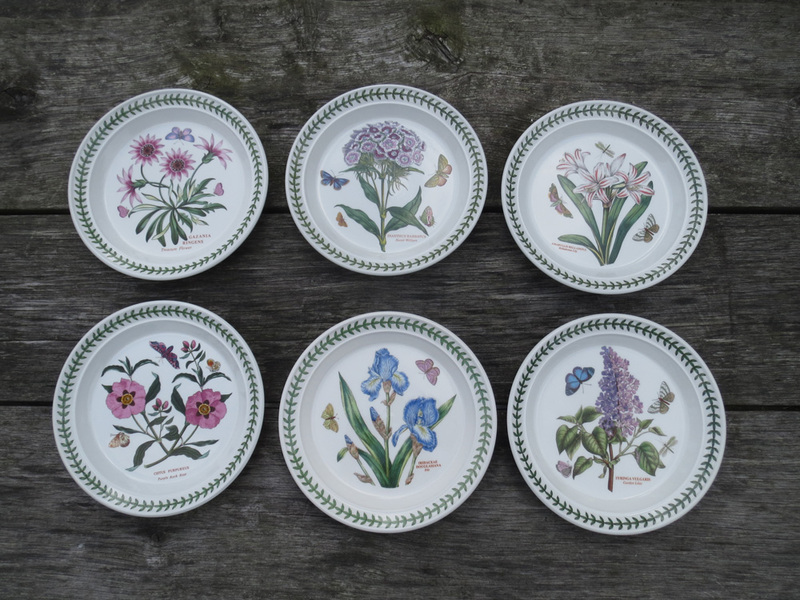 They are: January – Snowdrop, February – Sweet Violet, March – Wild Daffodil, April – Primula, May – Bluebell, June – Dog Rose, July – Pinks, August – Pansy, September – Aster, October – Dahlia, November – Bell Heather, December – Hellebore. 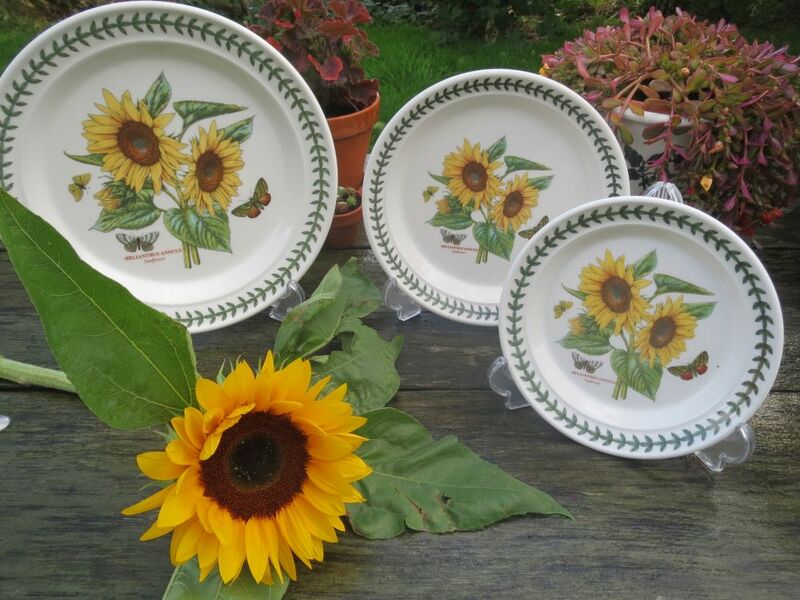 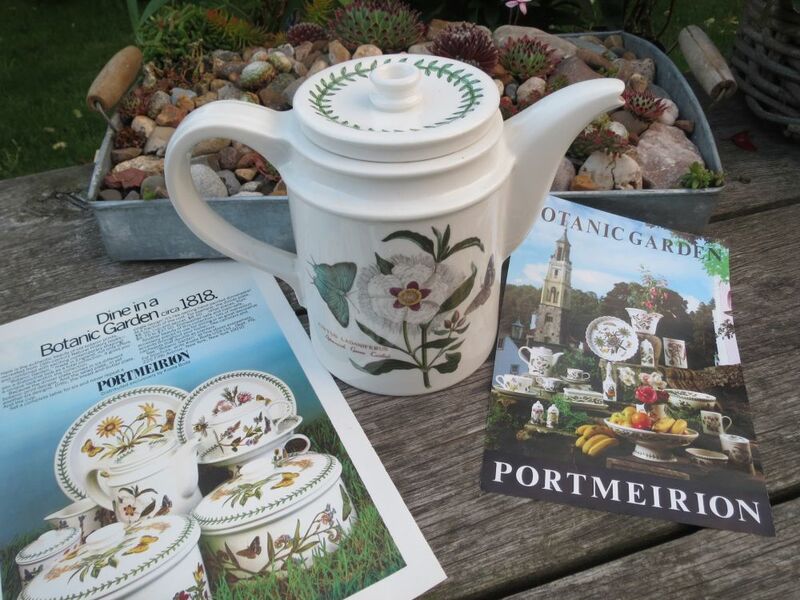 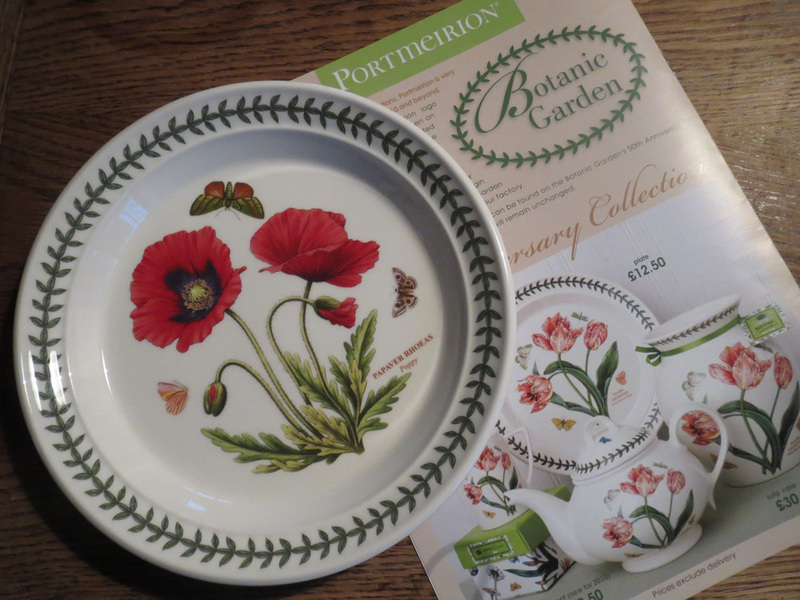 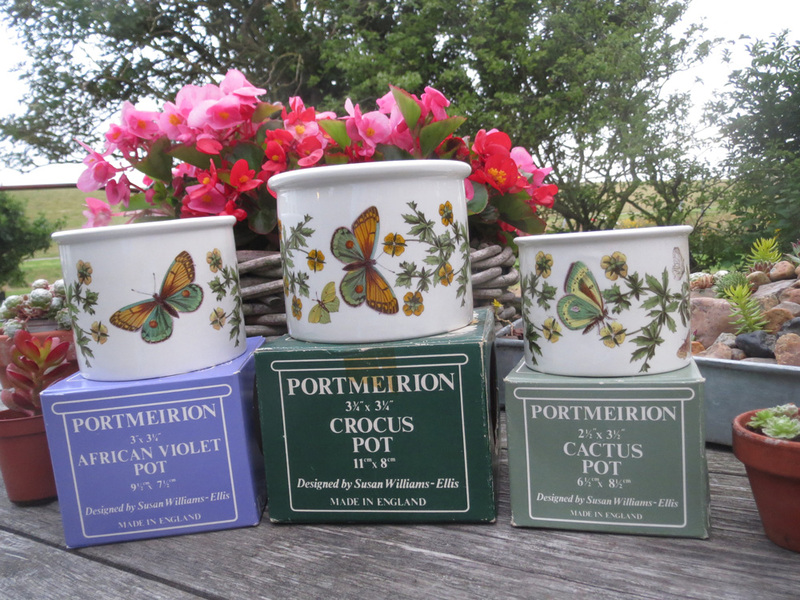 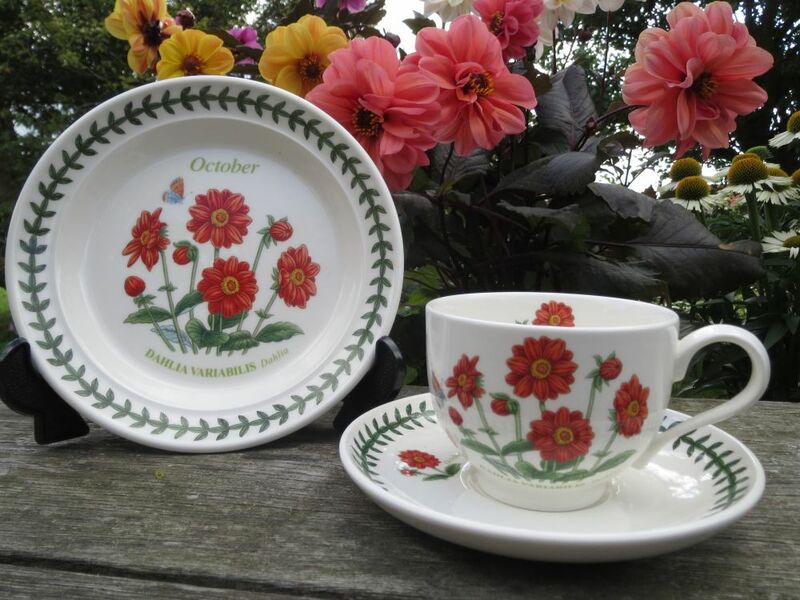 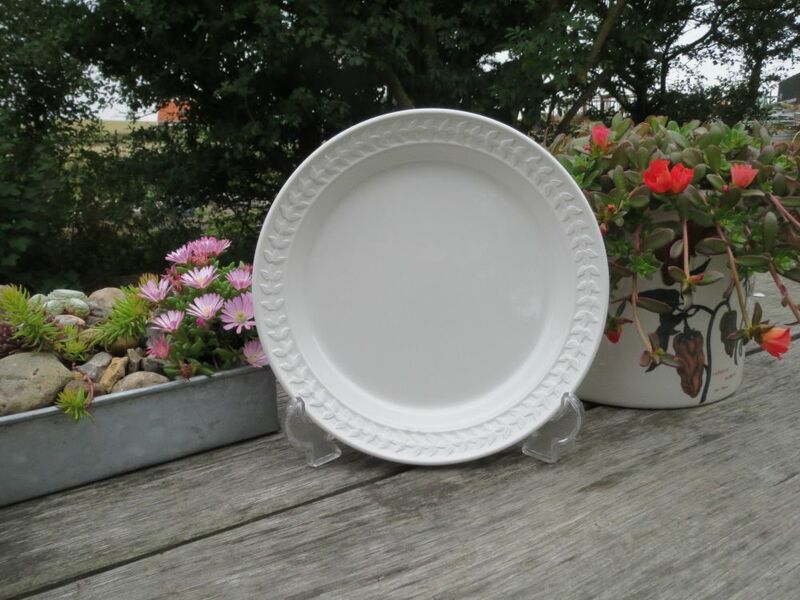 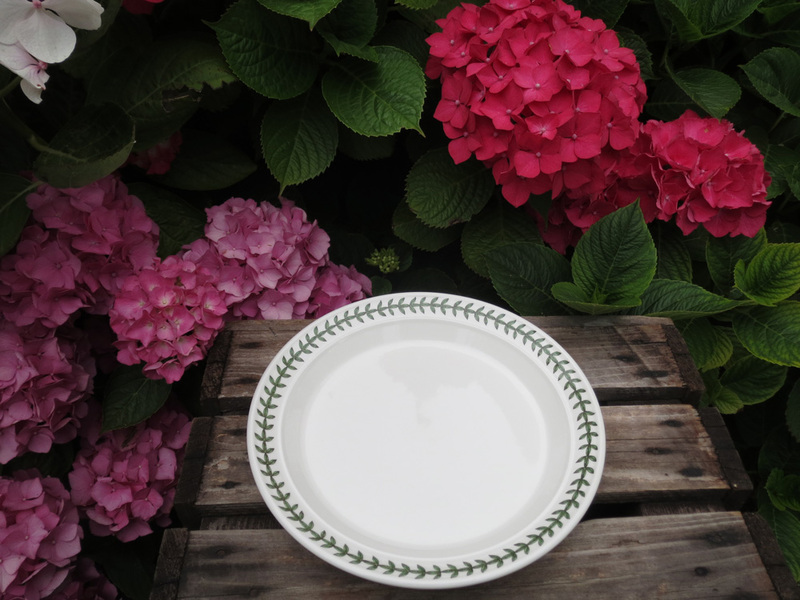 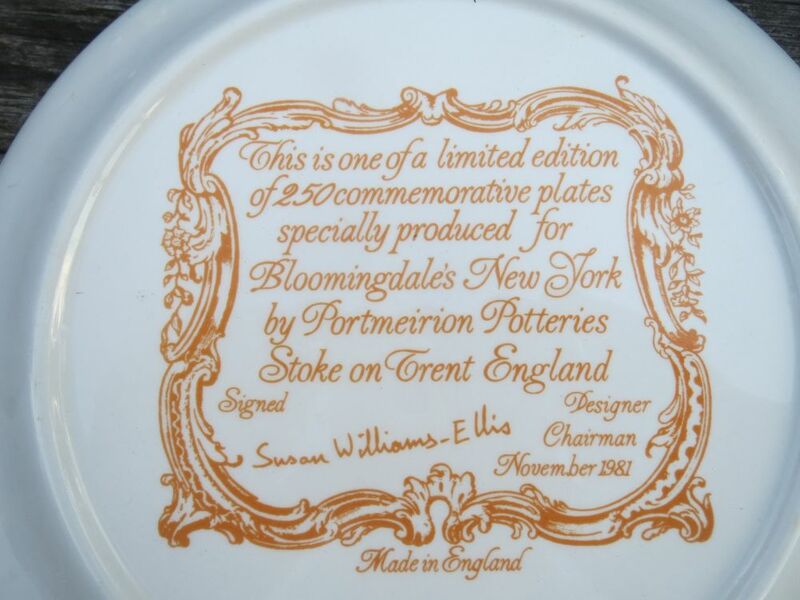 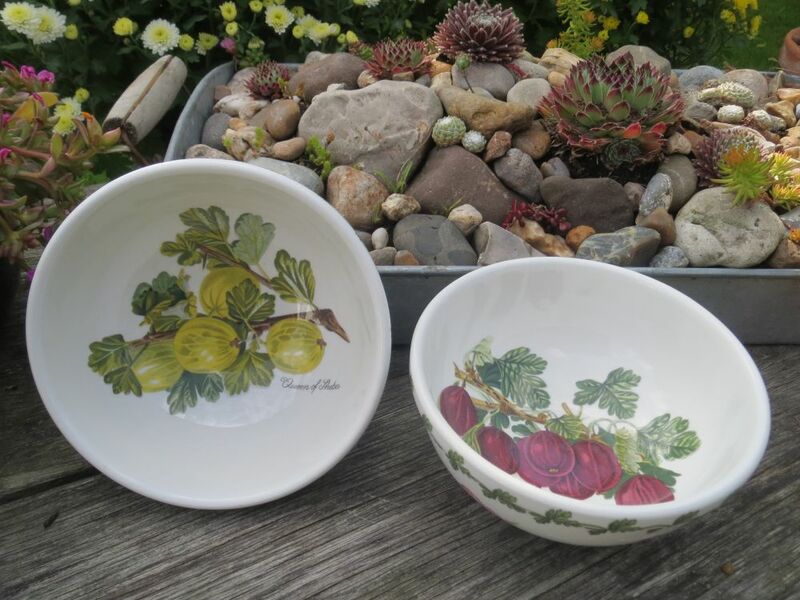 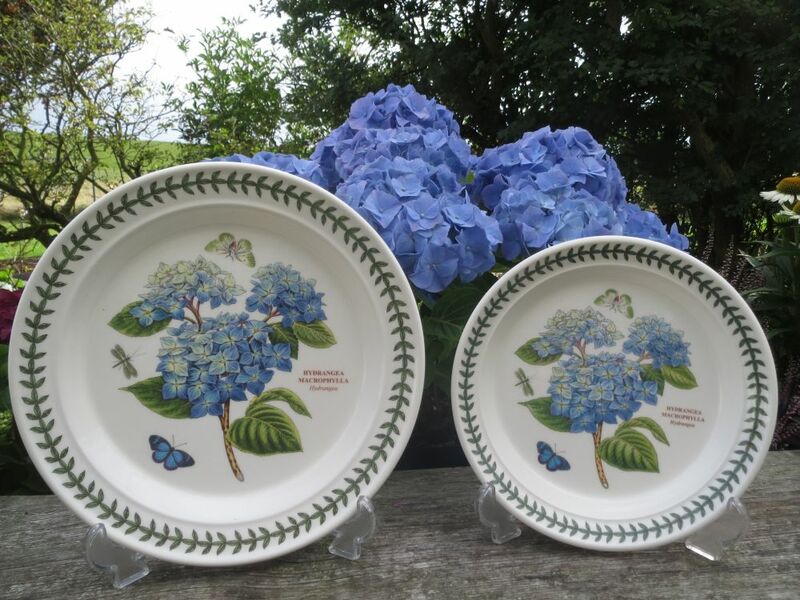 In 1973 the first set of dinnerware in the Portmeirion range had several drumshaped dishes or tureens, as well as the Meridian shaped soupbowls. 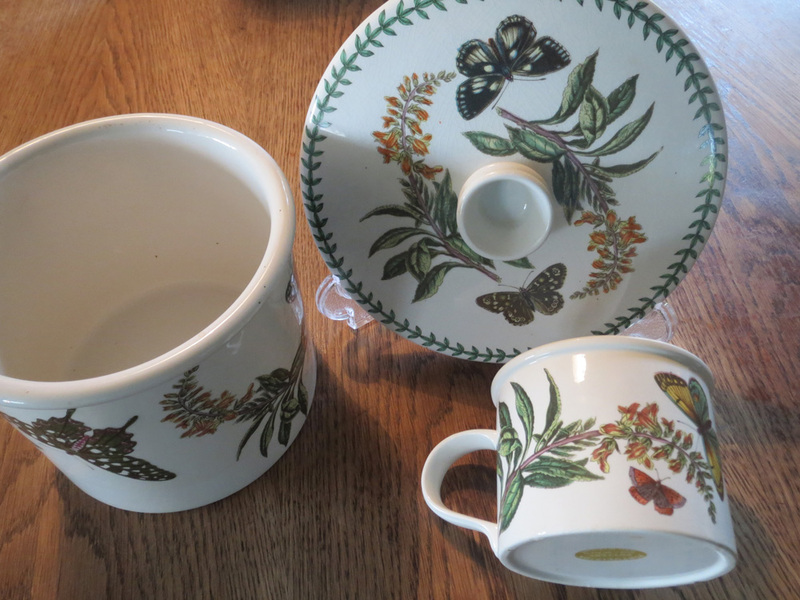 They have the old motifs with dark coloured butterflies. 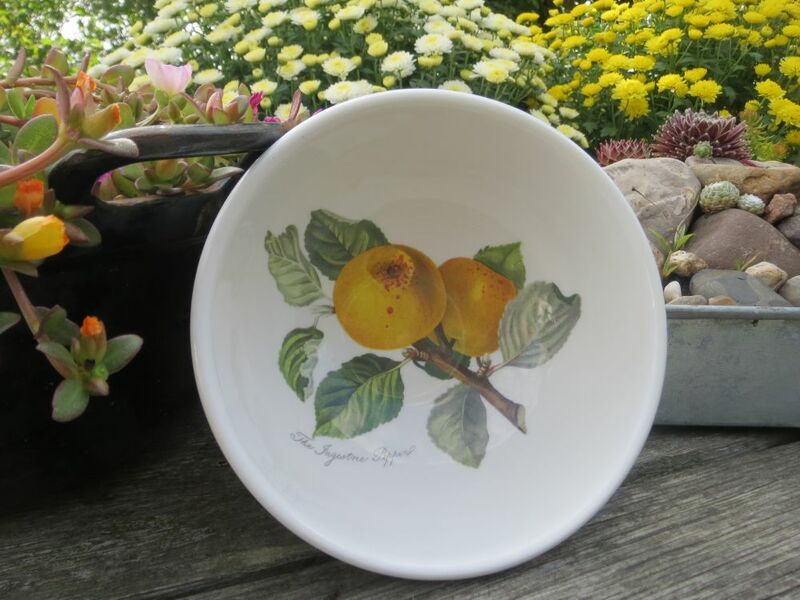 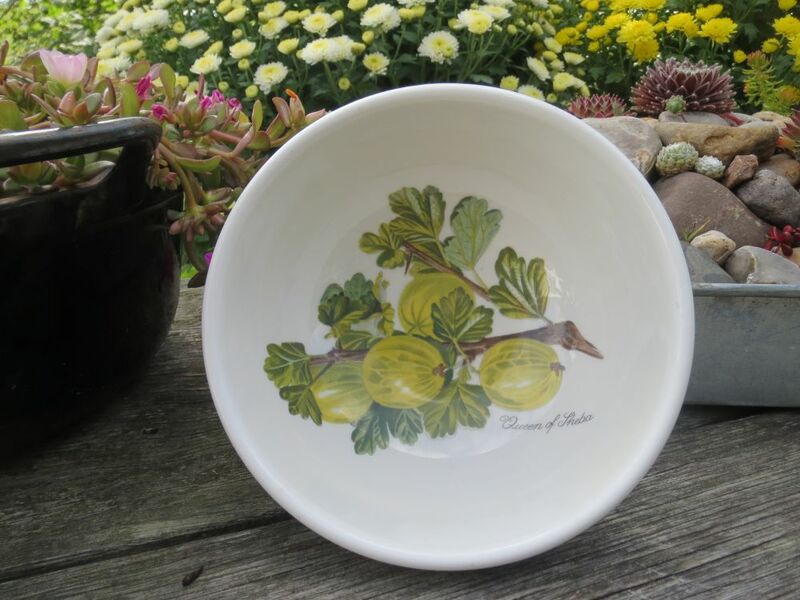 The low dish in the front of the picture only occurs in the oldest sets, and I have only seen it with the Citrus. 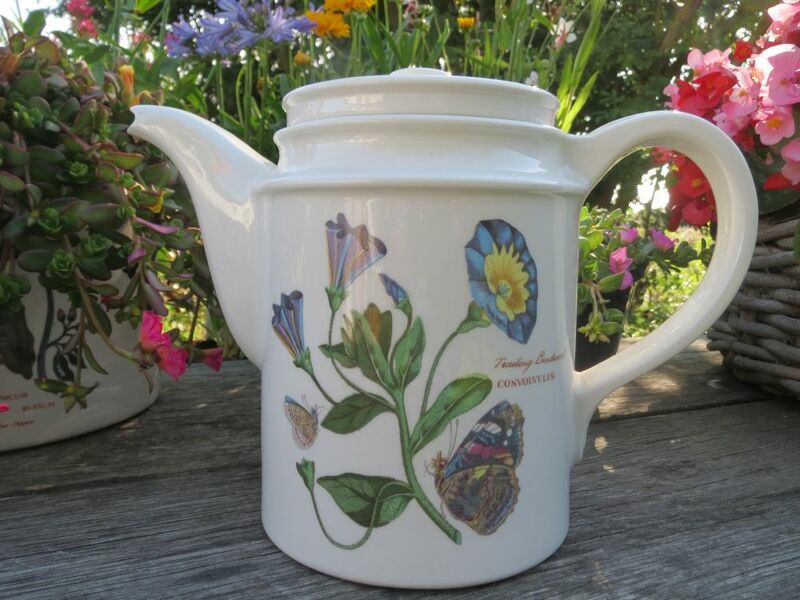 The Scarlet Pimpernel, Forget-me-not, Rhododendron, Common Tomentil, Heartsease and Speedwell. 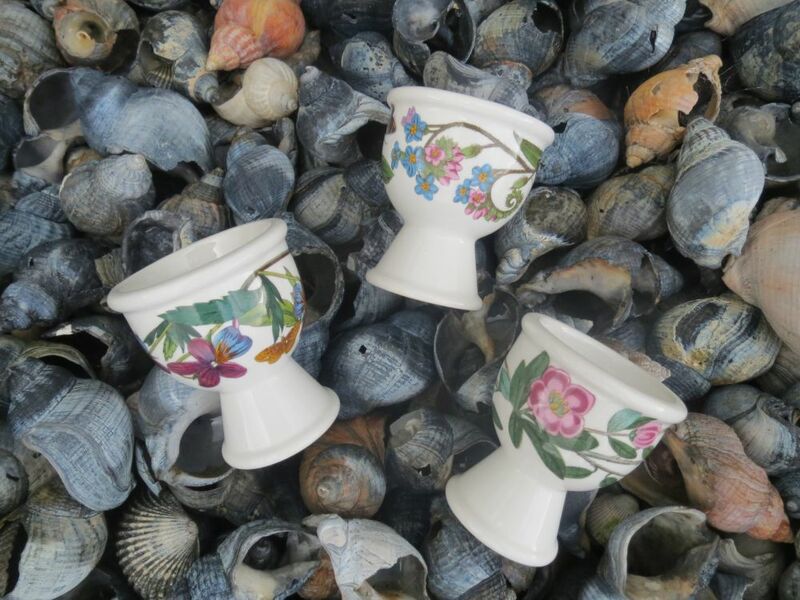 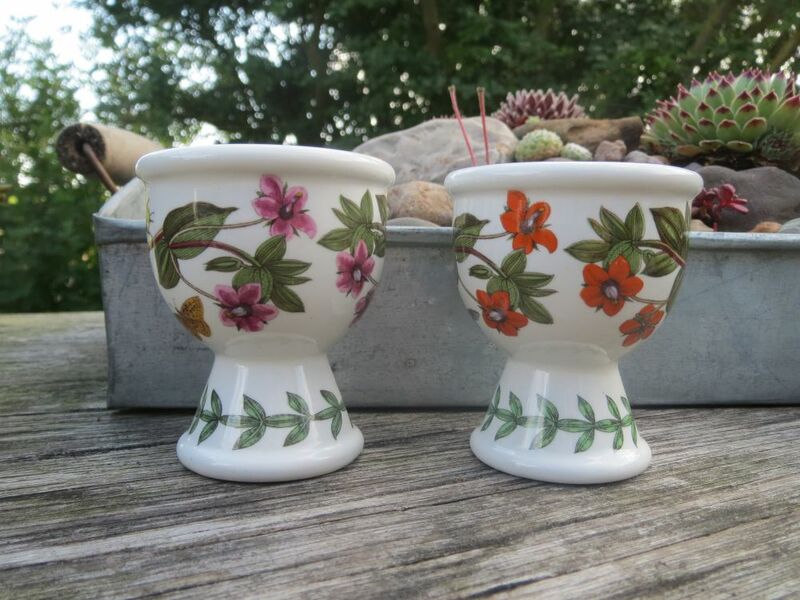 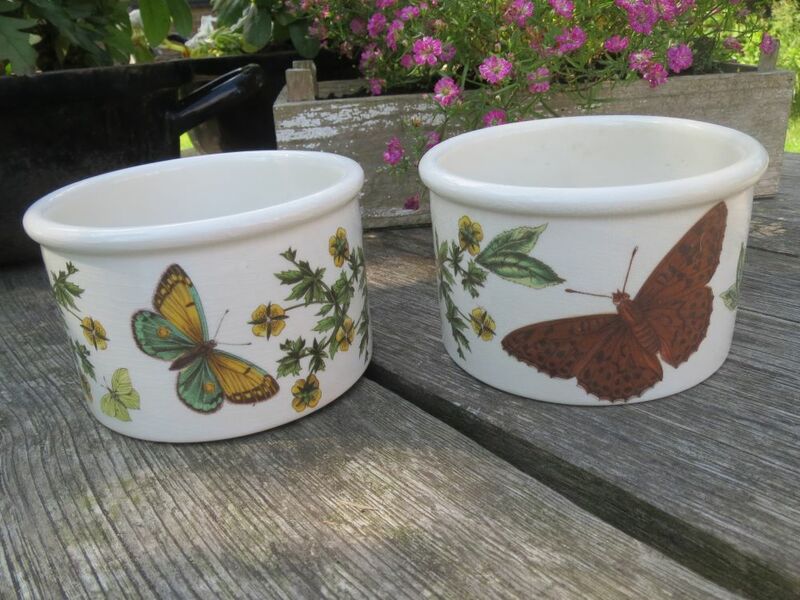 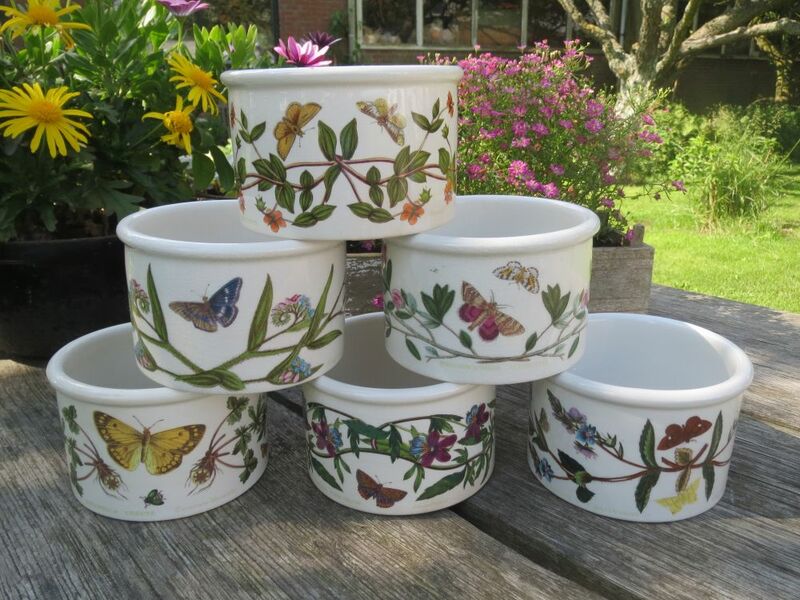 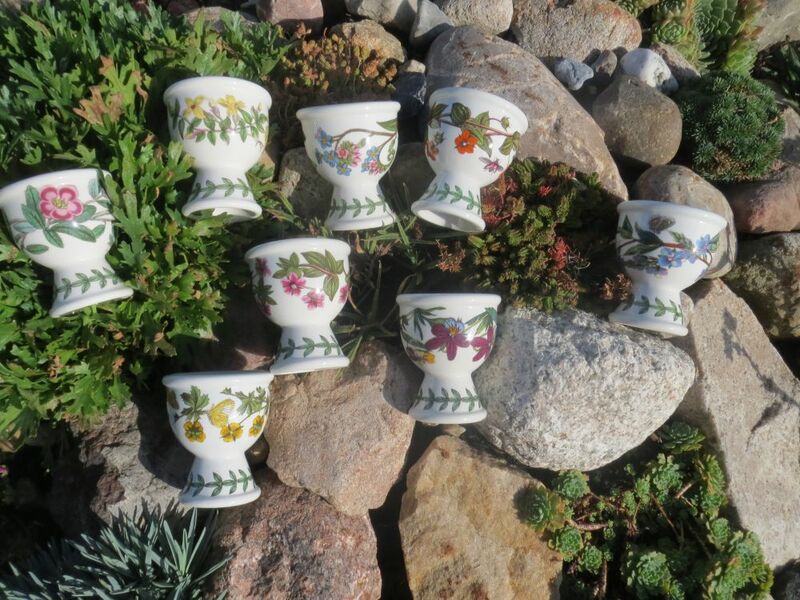 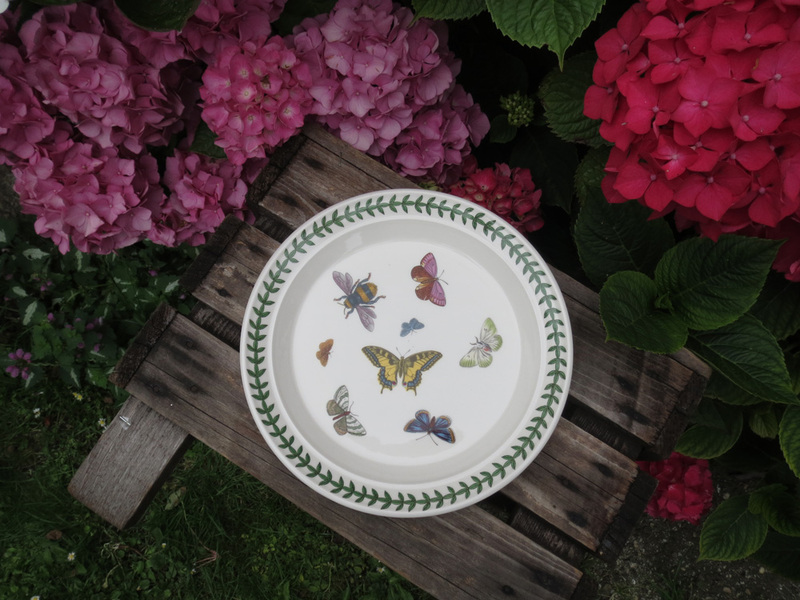 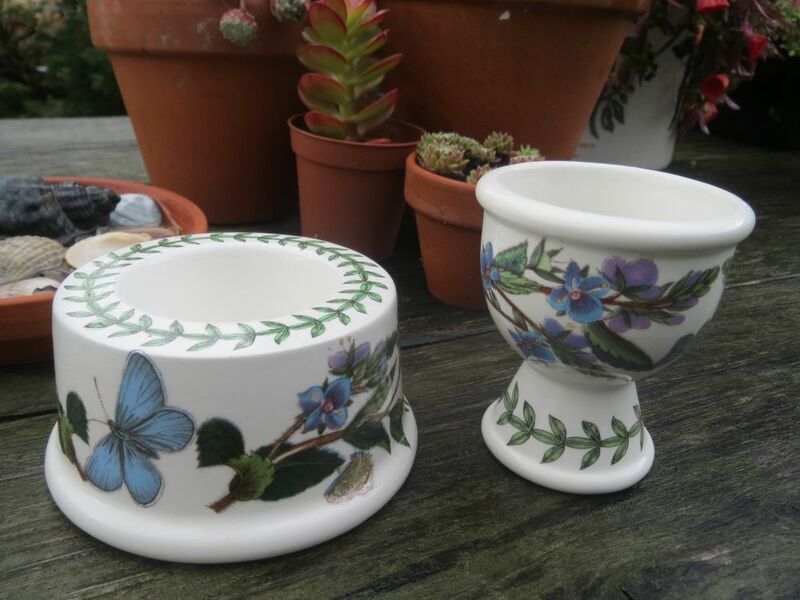 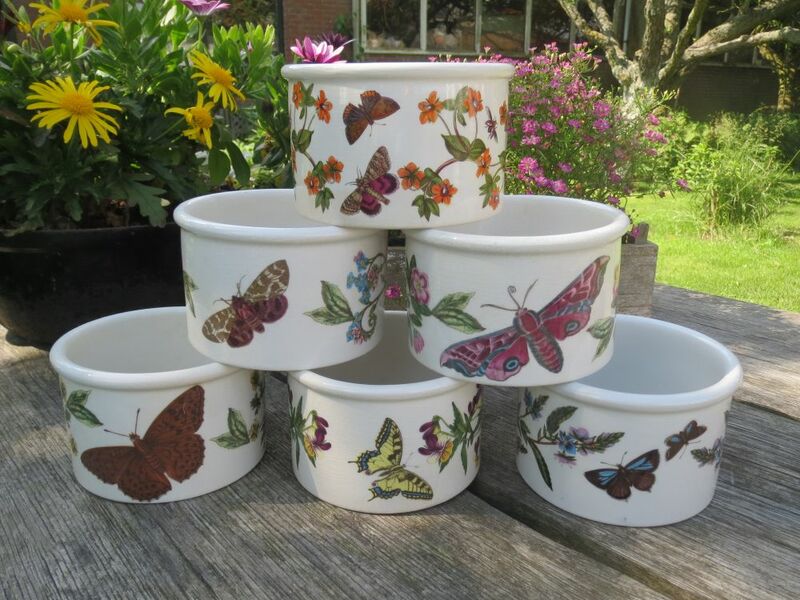 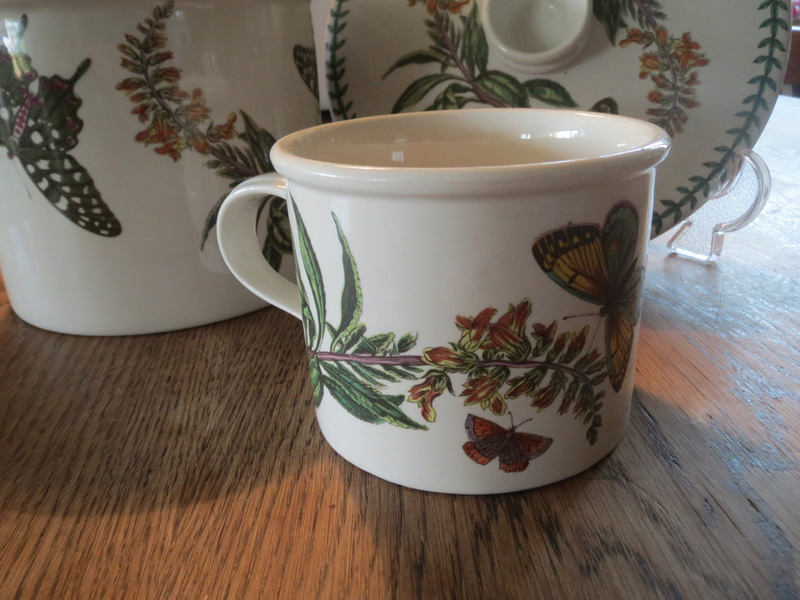 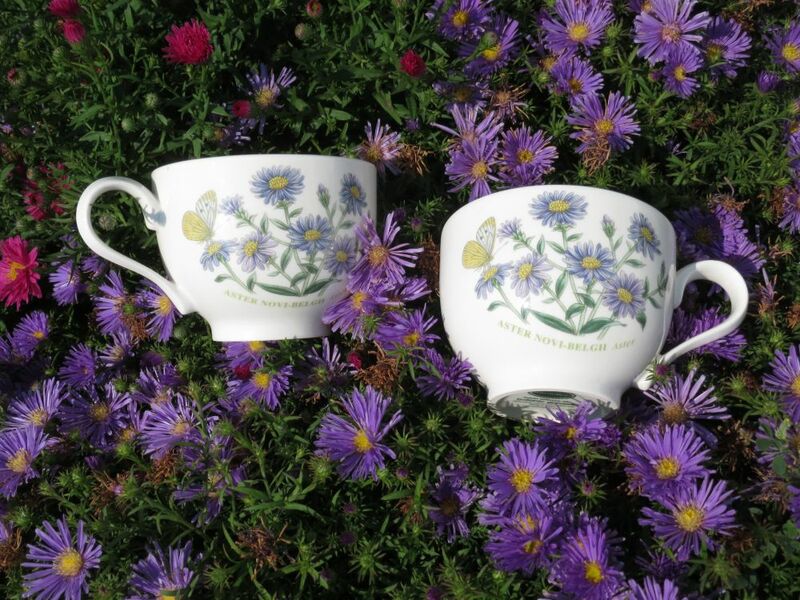 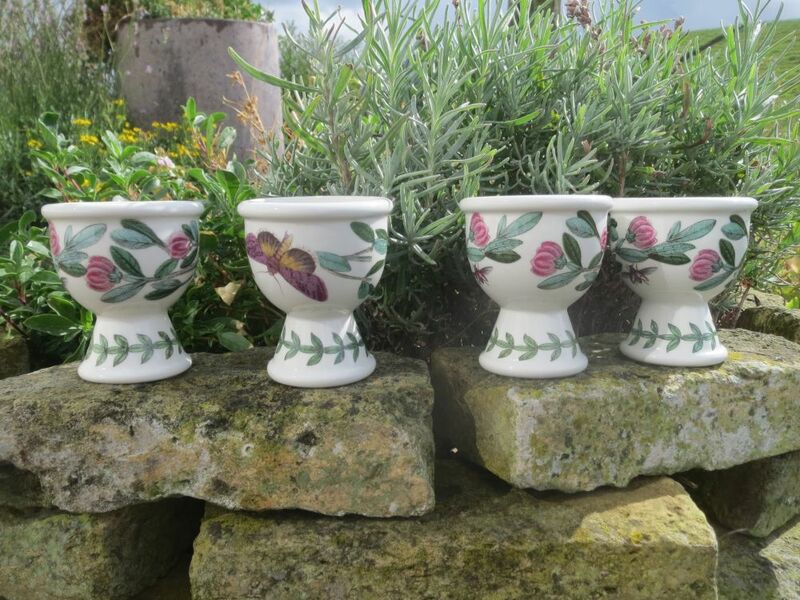 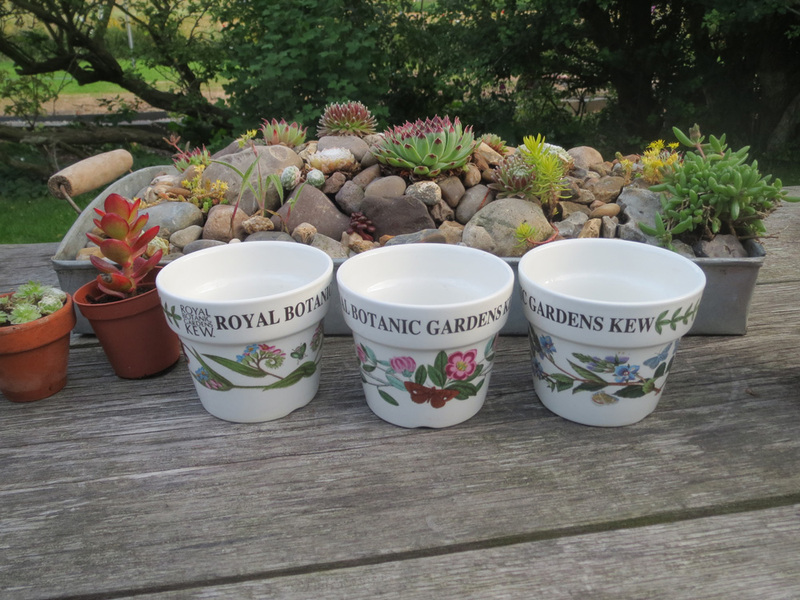 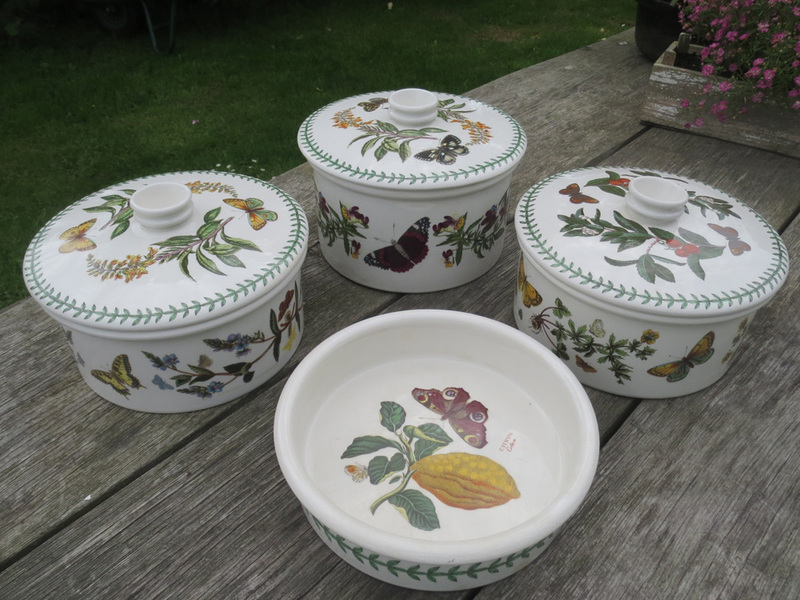 The bowls are quite large, therefore large butterflies were added to fill up the empty space on the cups. 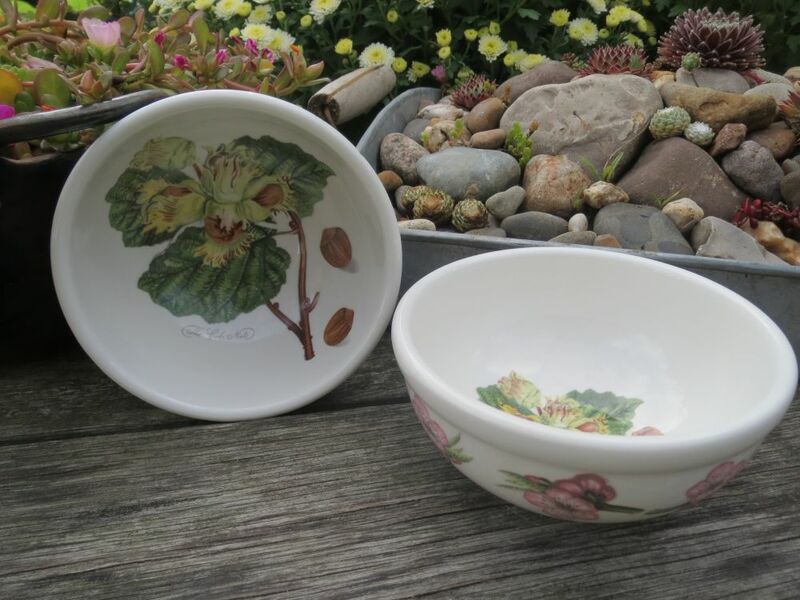 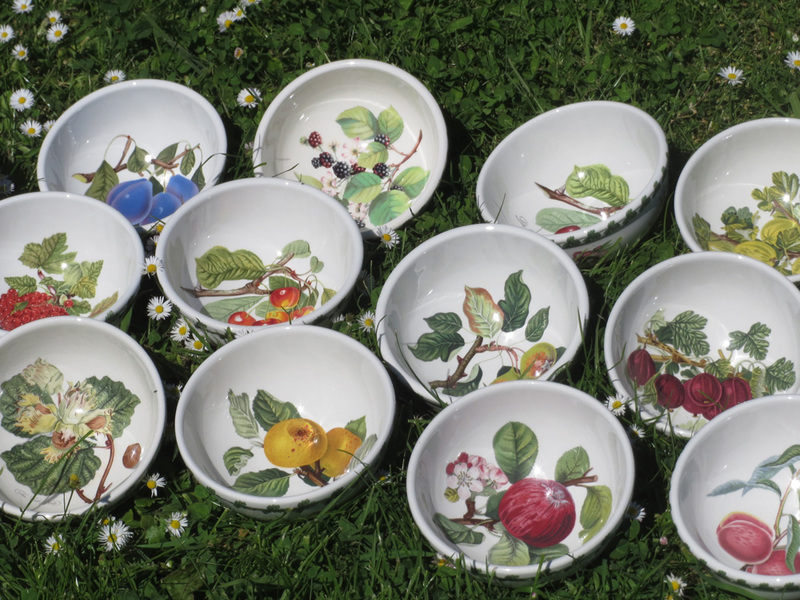 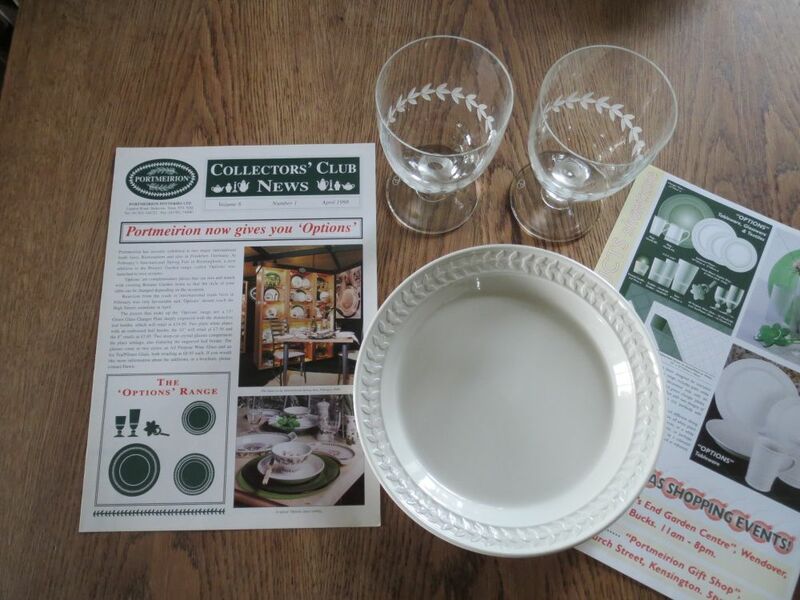 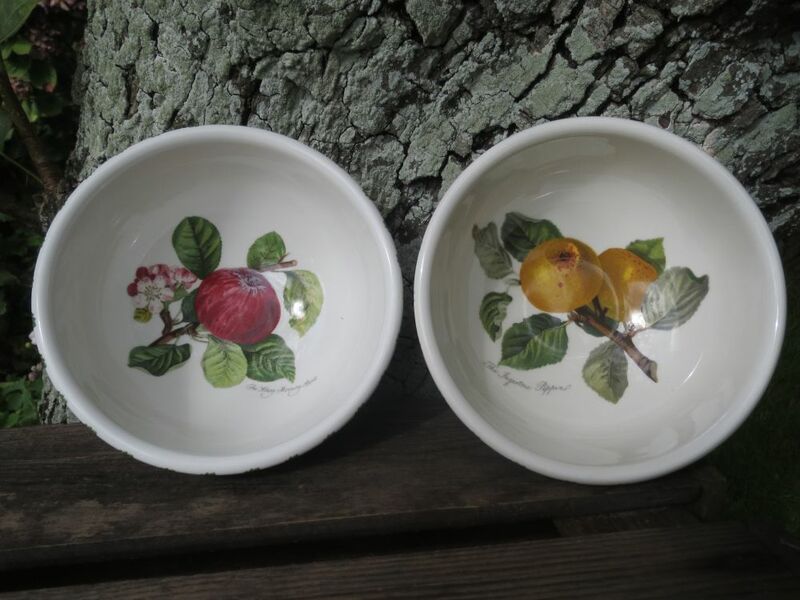 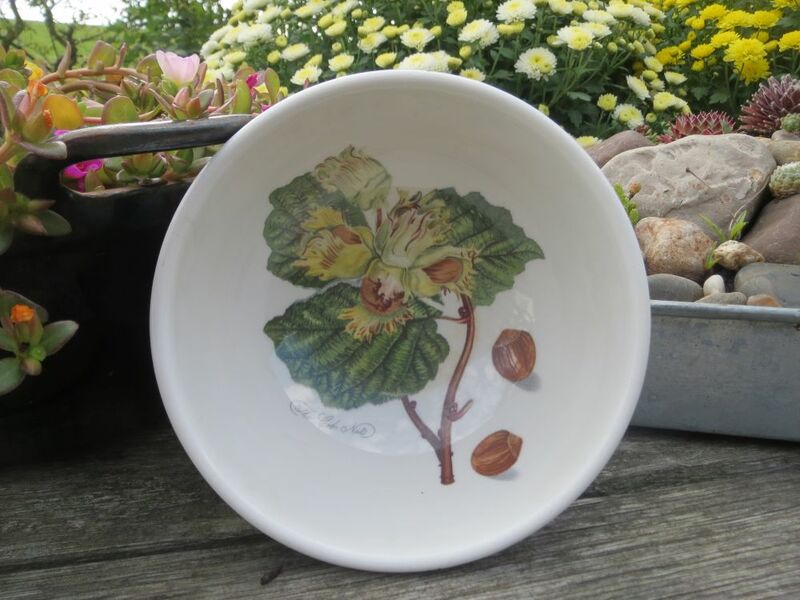 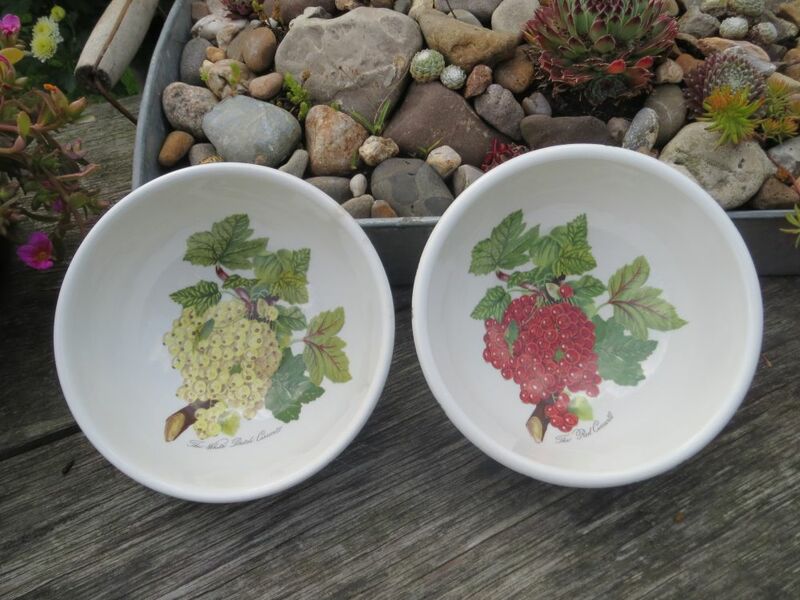 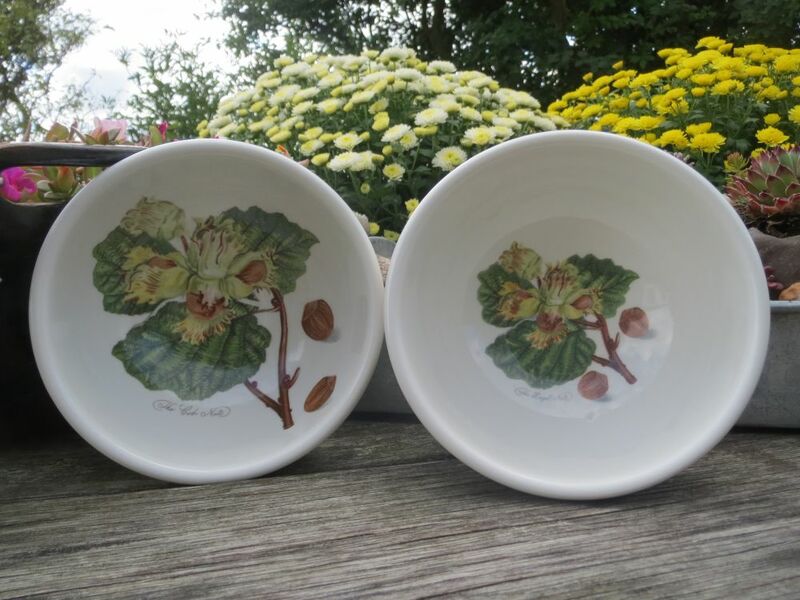 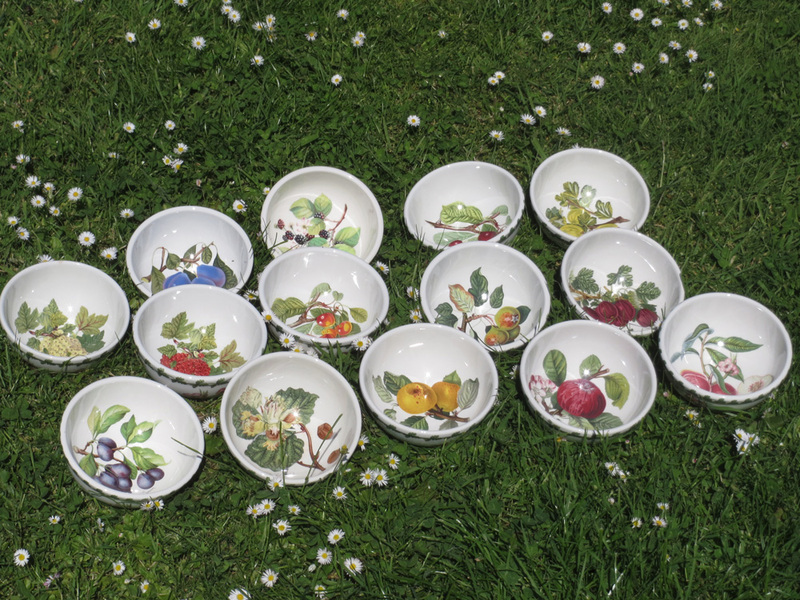 The bowls came with white saucers with the leafed border. 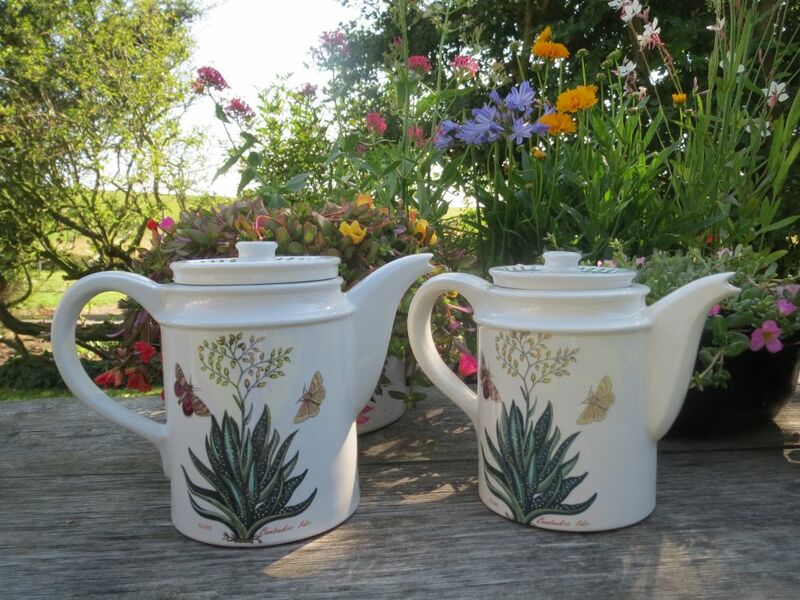 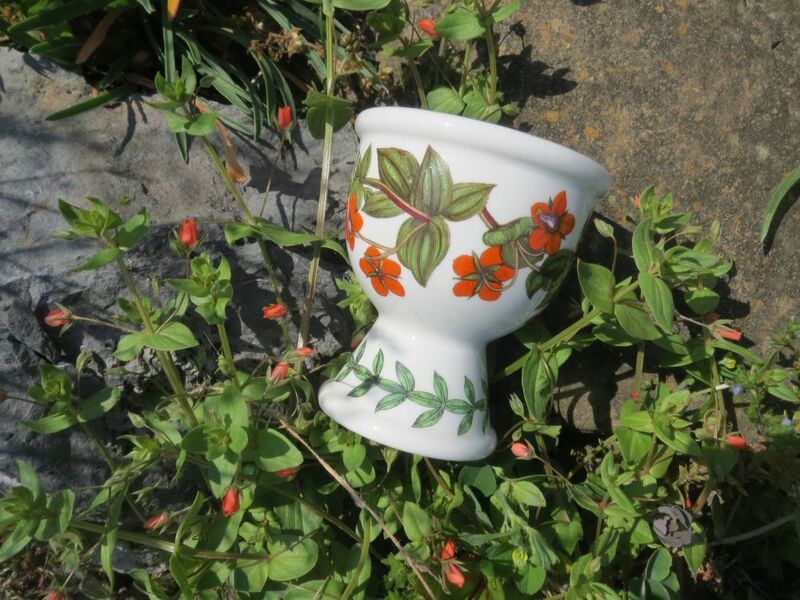 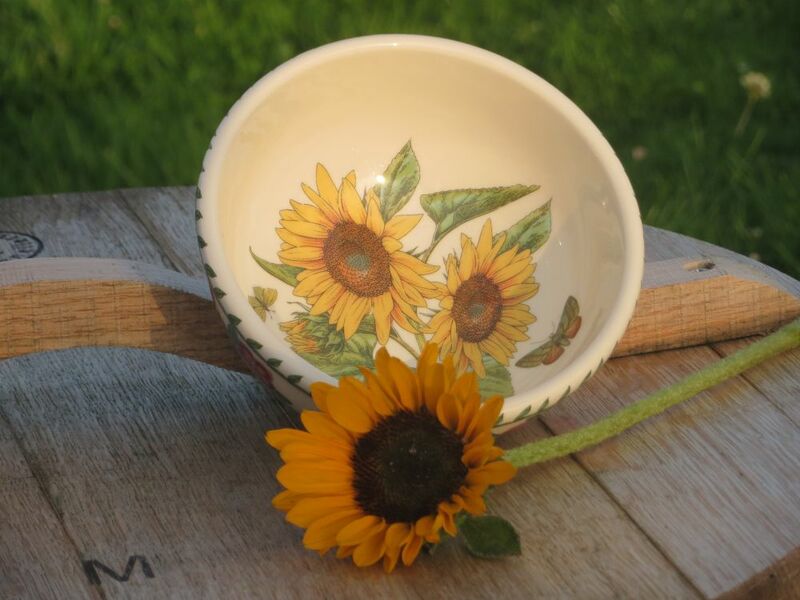 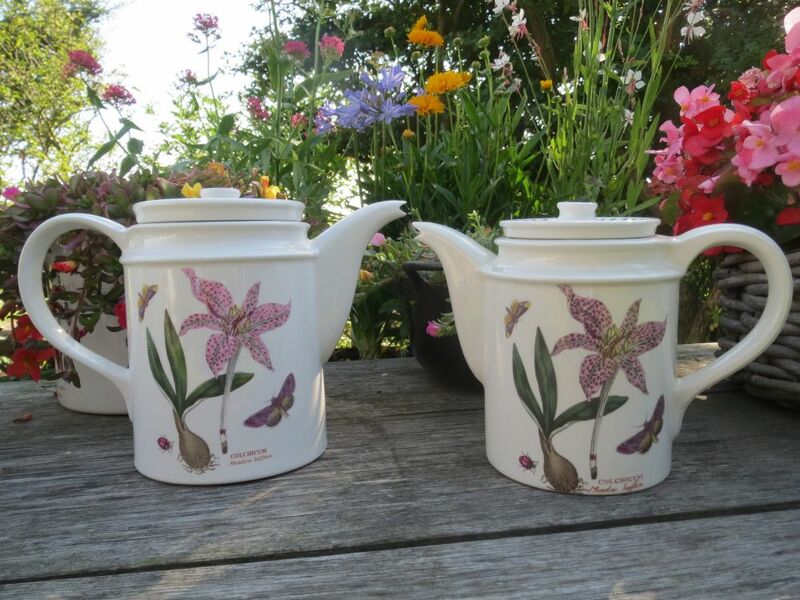 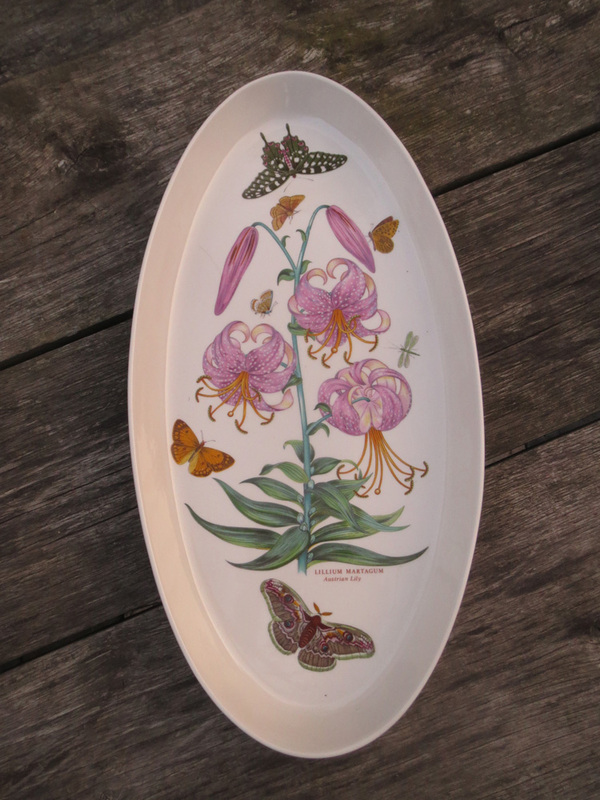 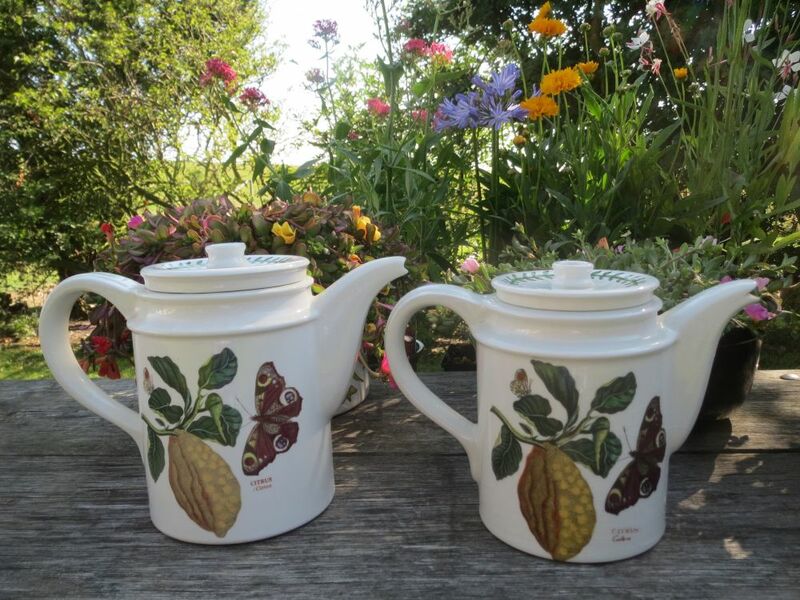 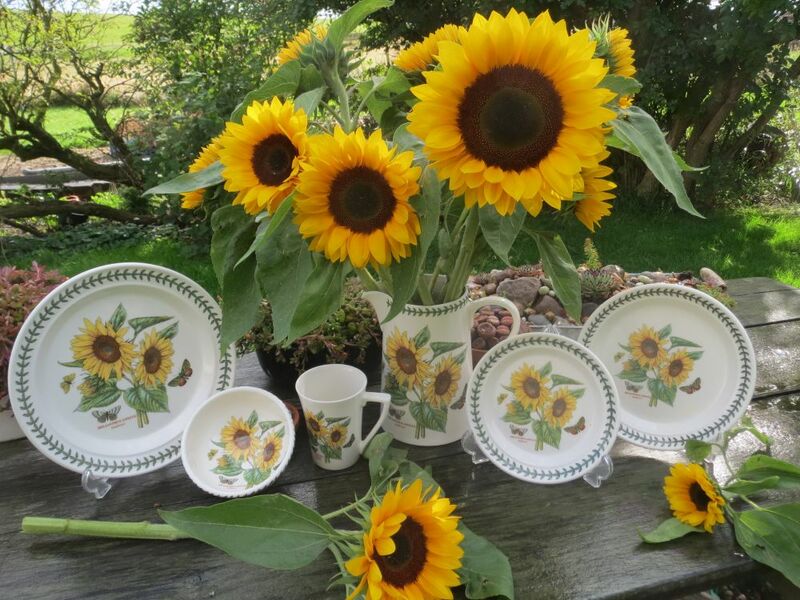 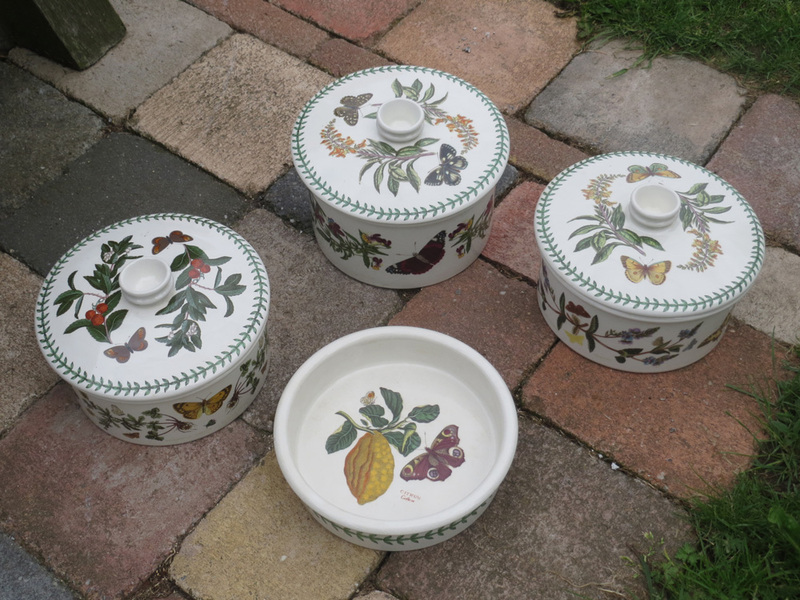 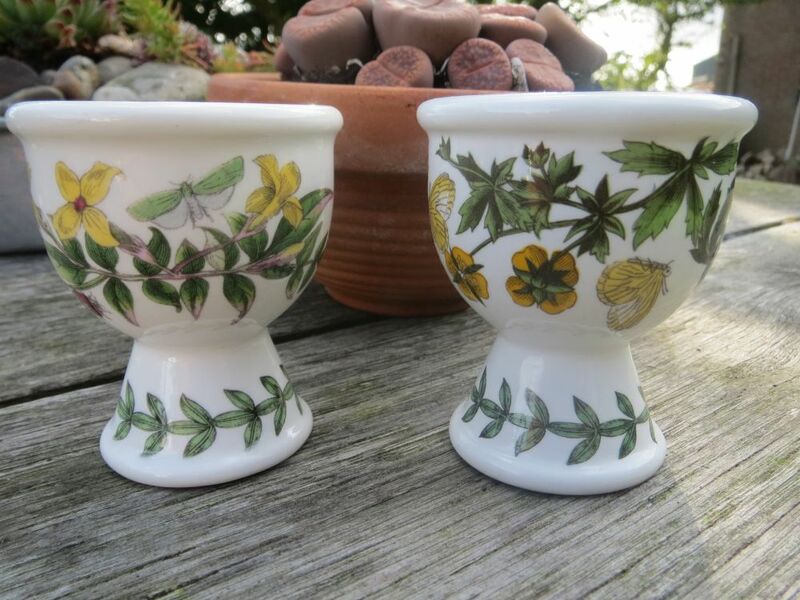 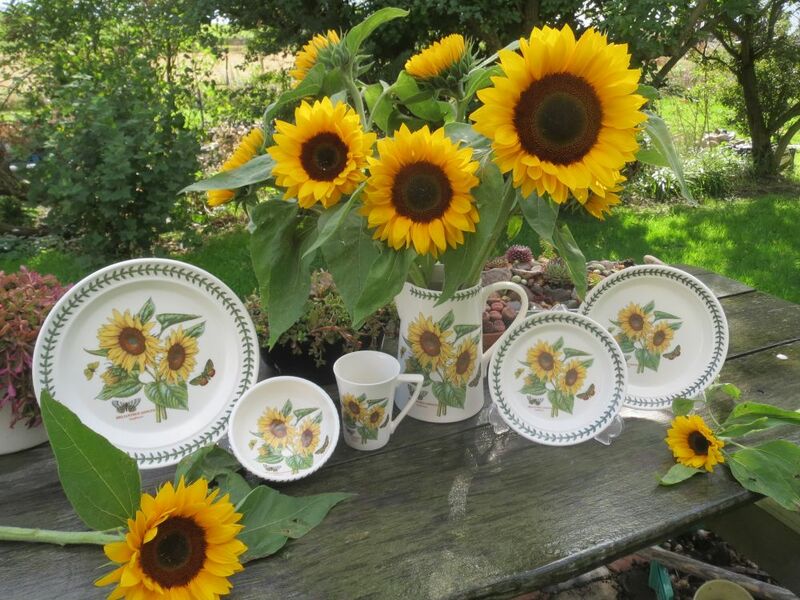 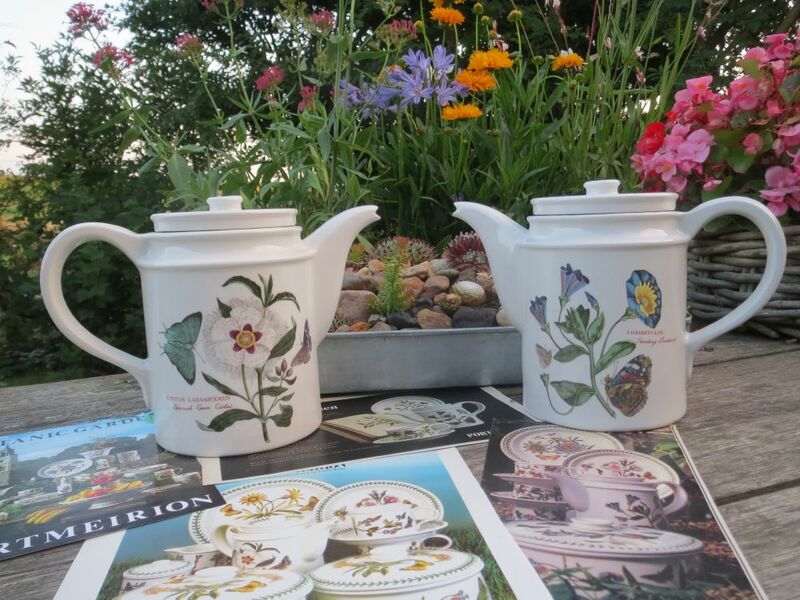 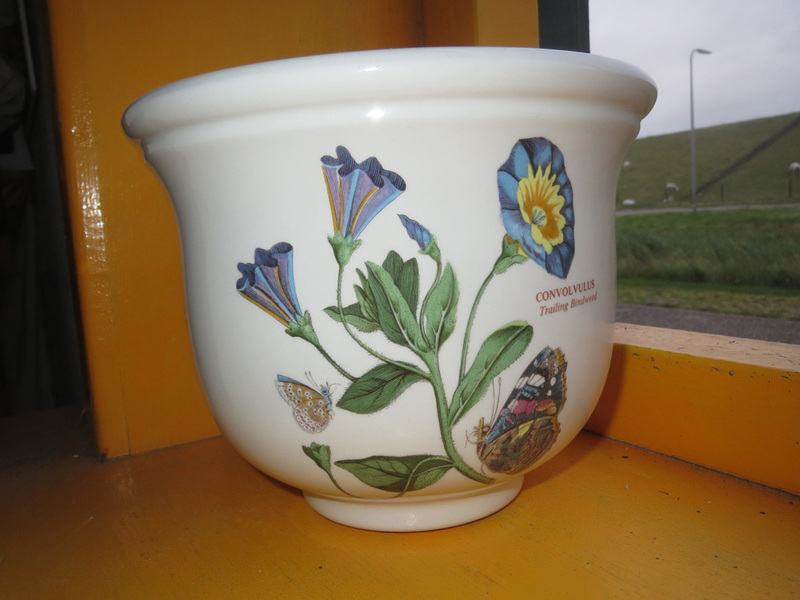 The Yellow Foxglove is an early motif that was depicted on 8 inch drum shaped tureen lids and on planters. 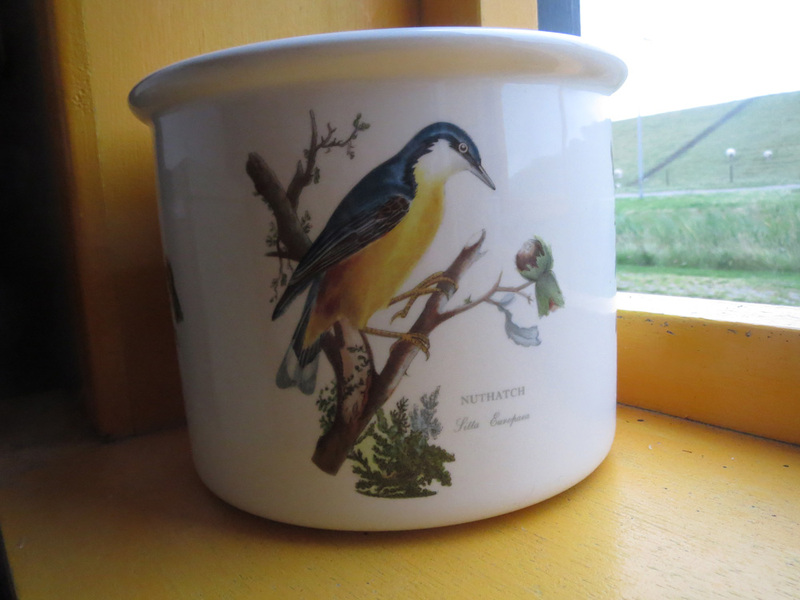 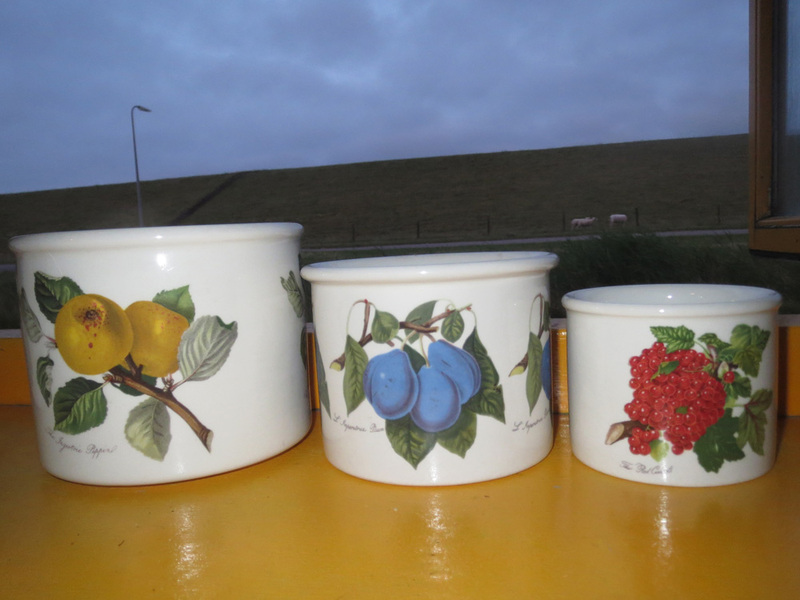 The mug has the mustard coloured oval backstamp. 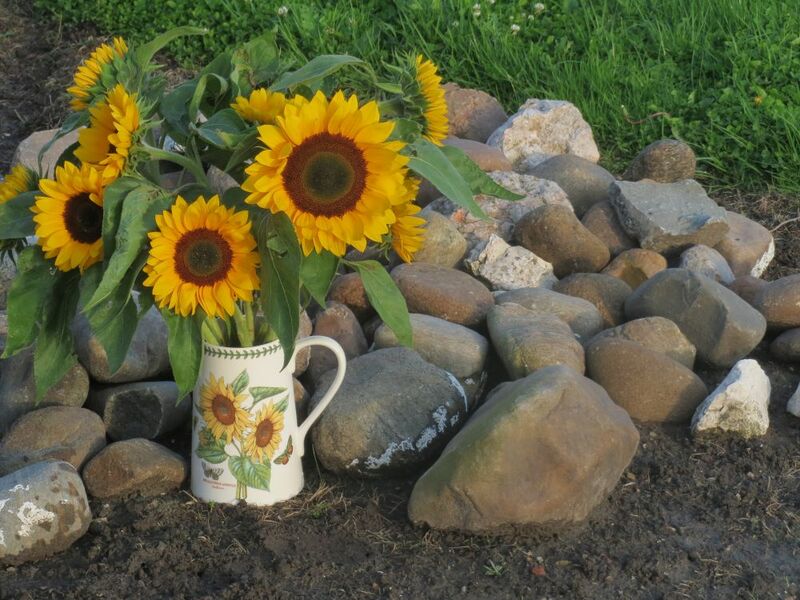 I expect it is another trial. 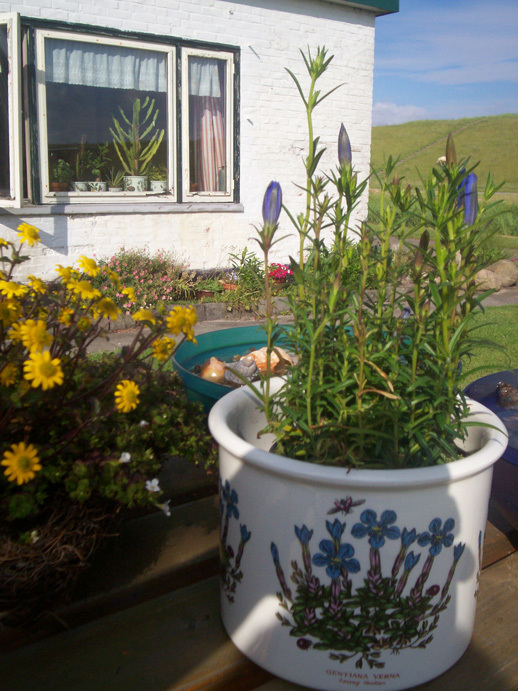 But a very nice one! 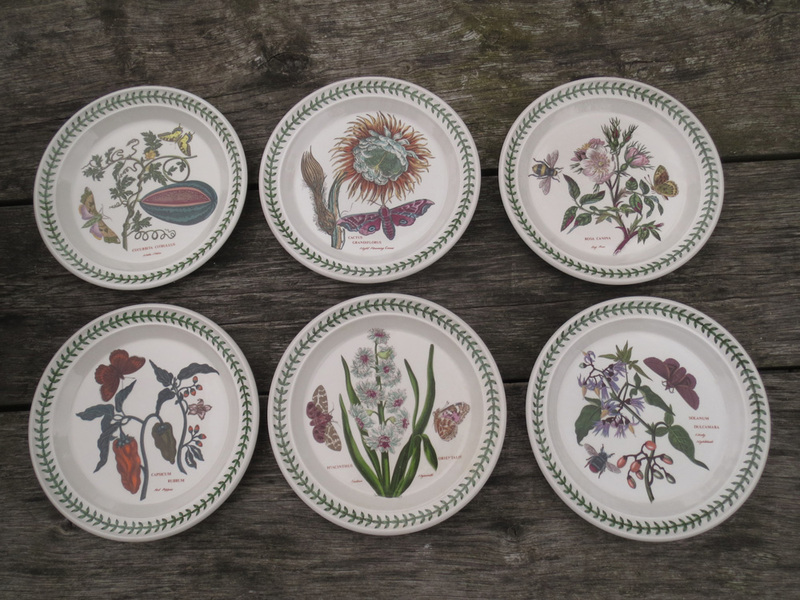 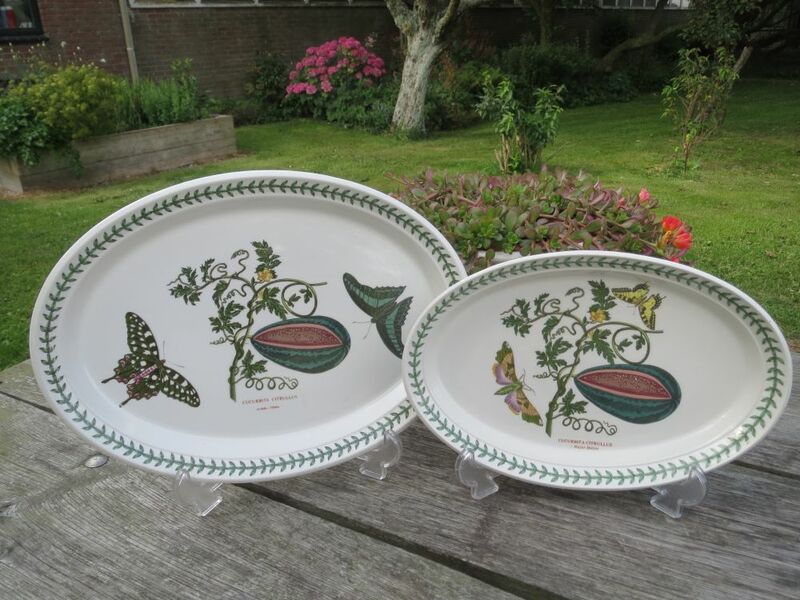 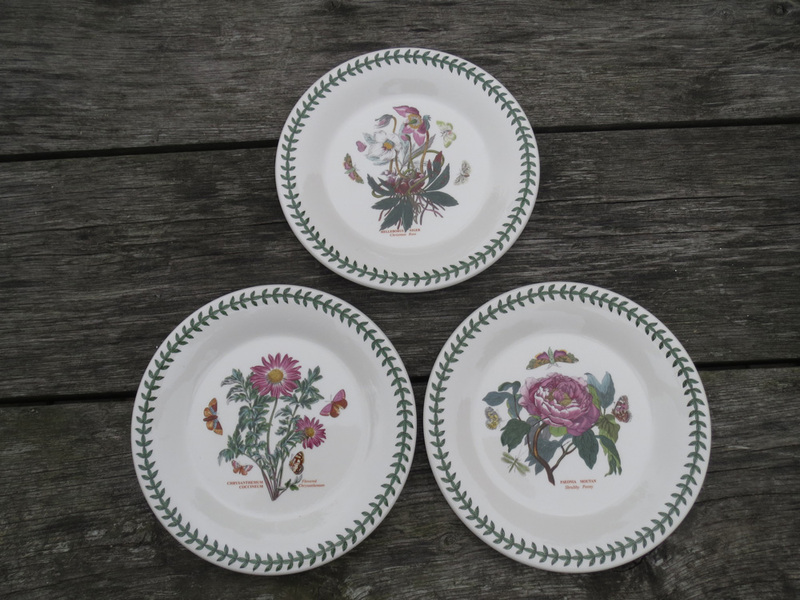 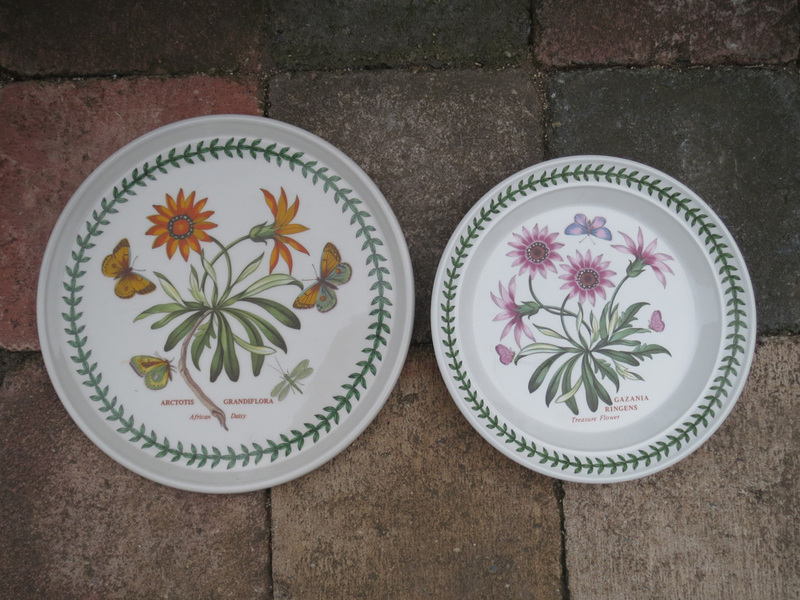 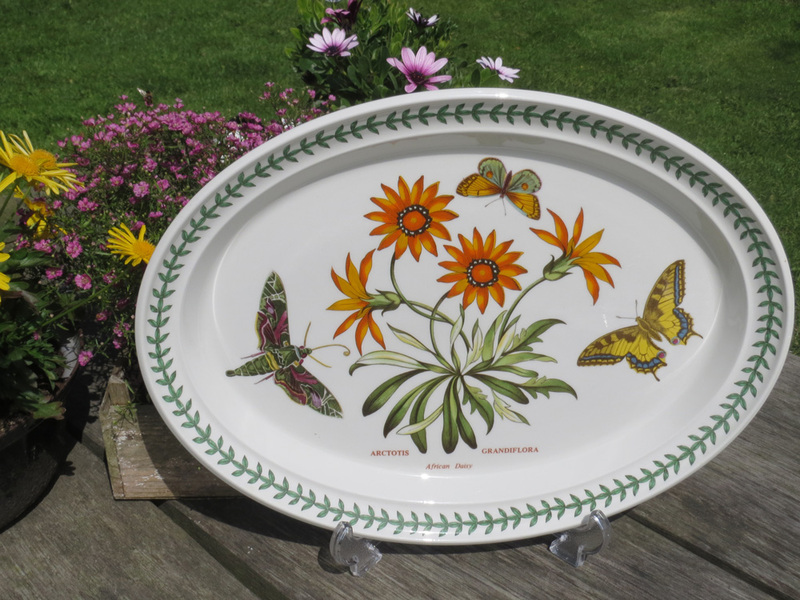 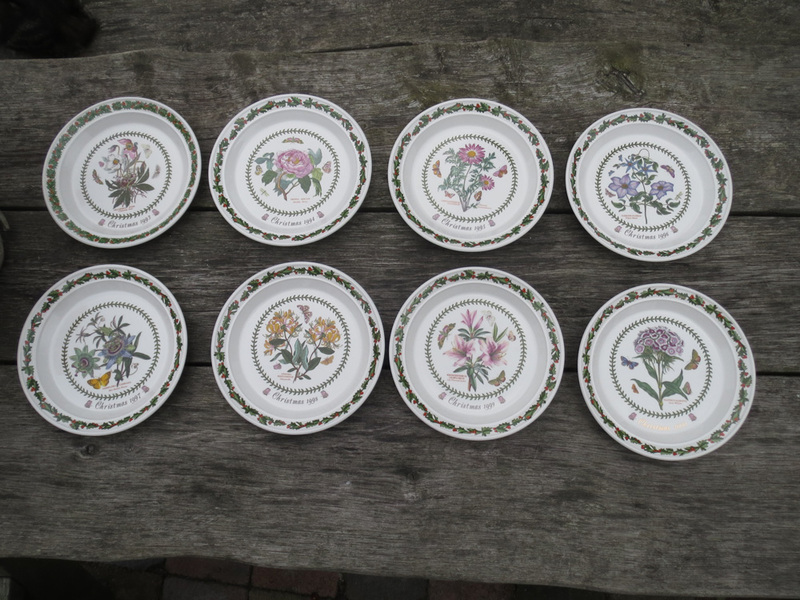 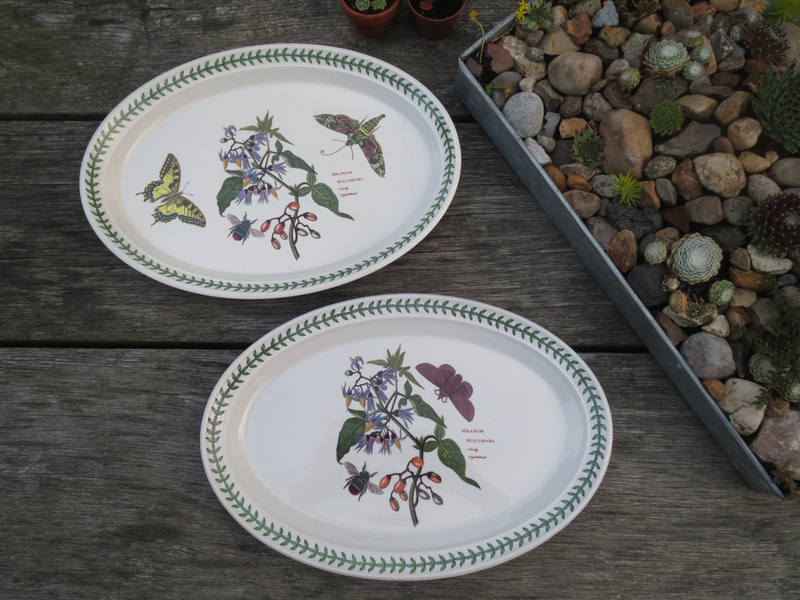 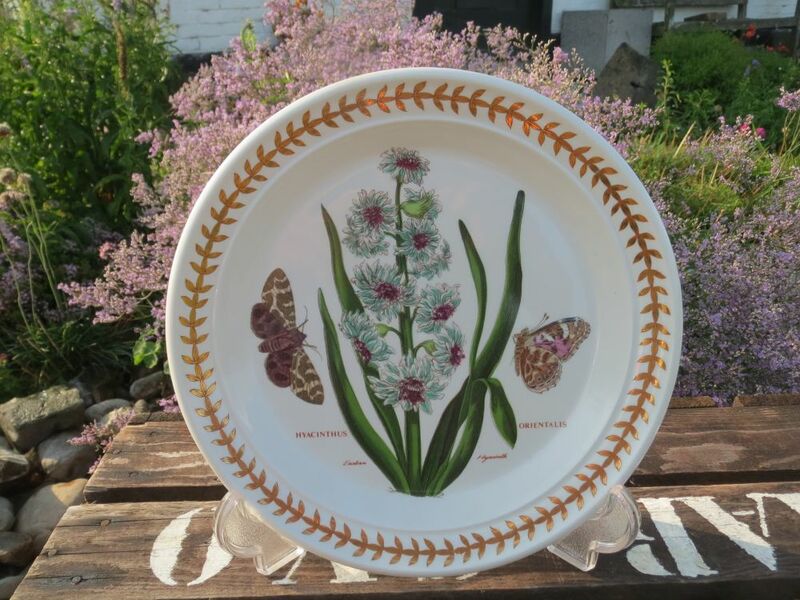 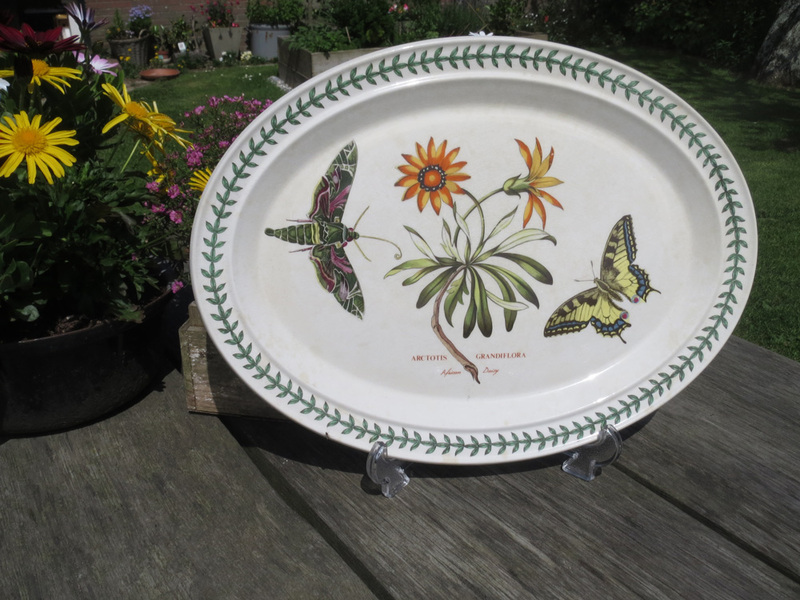 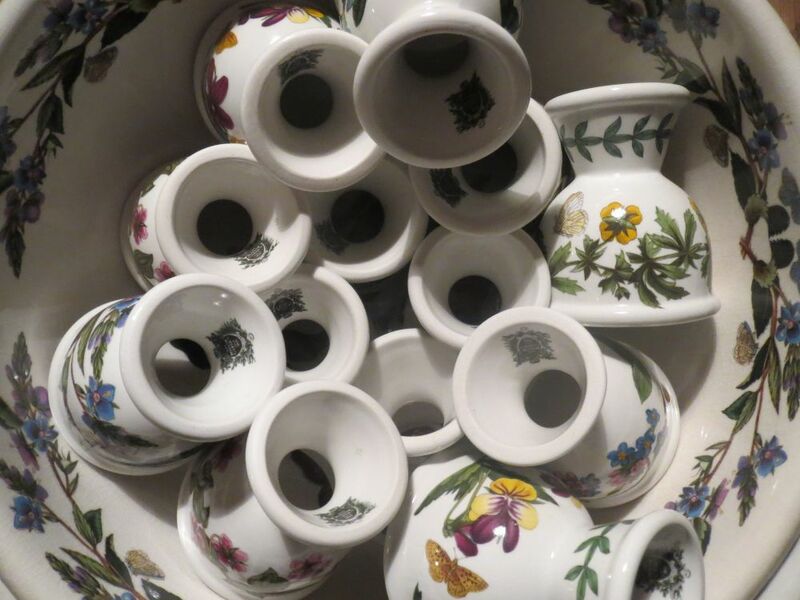 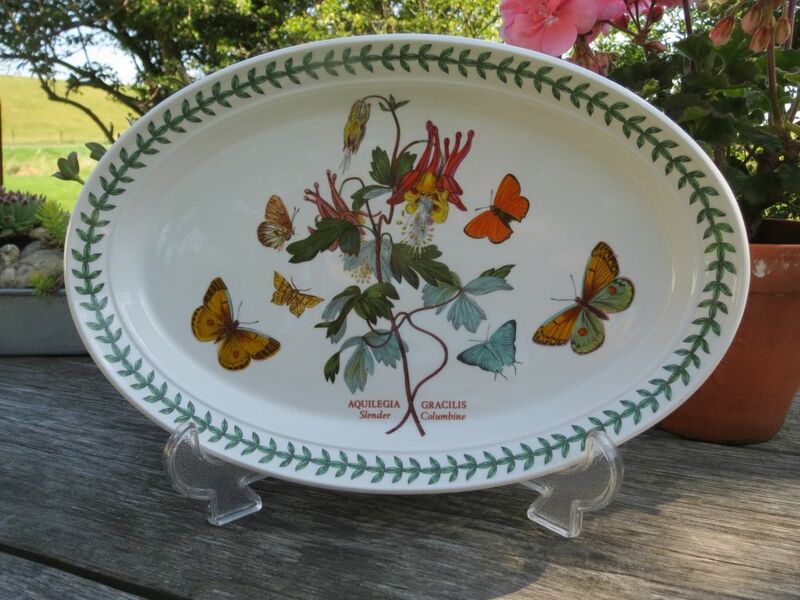 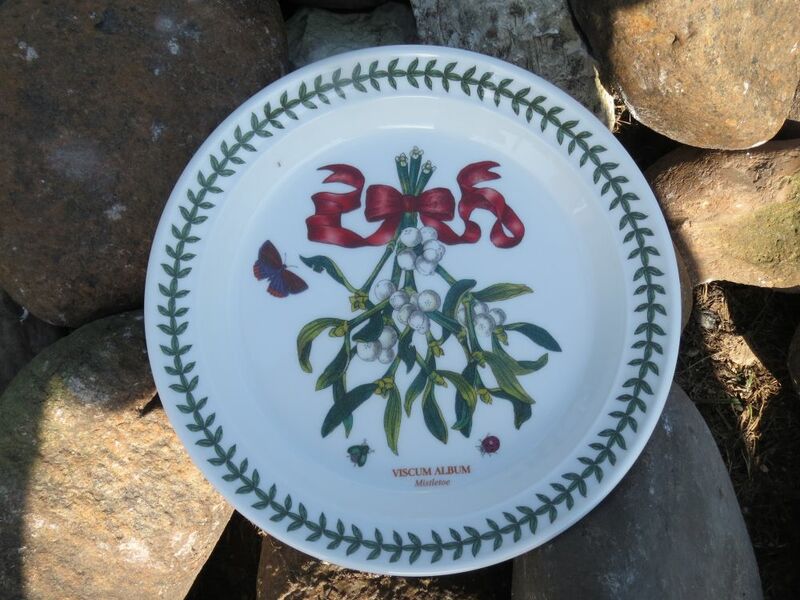 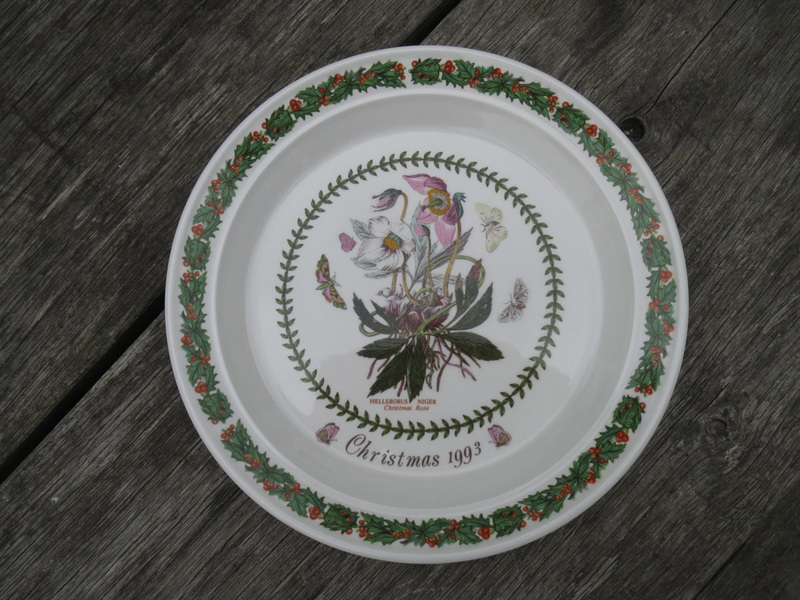 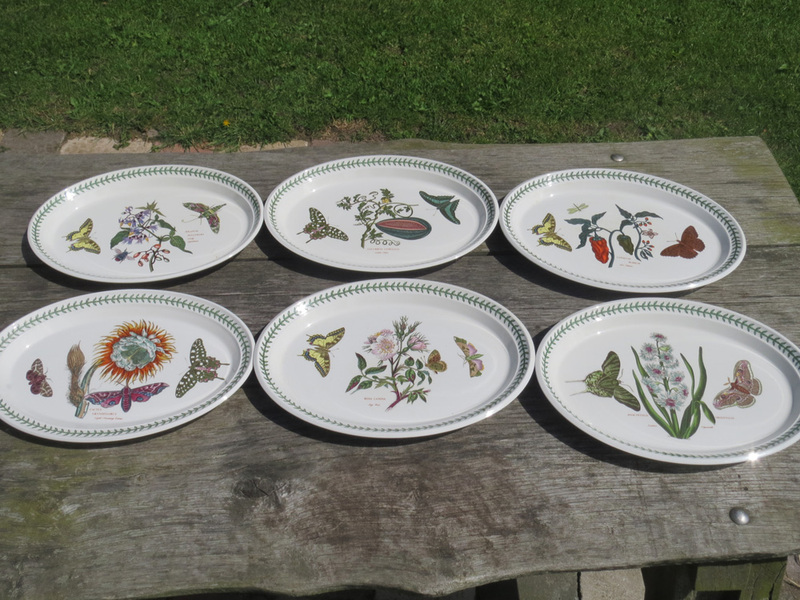 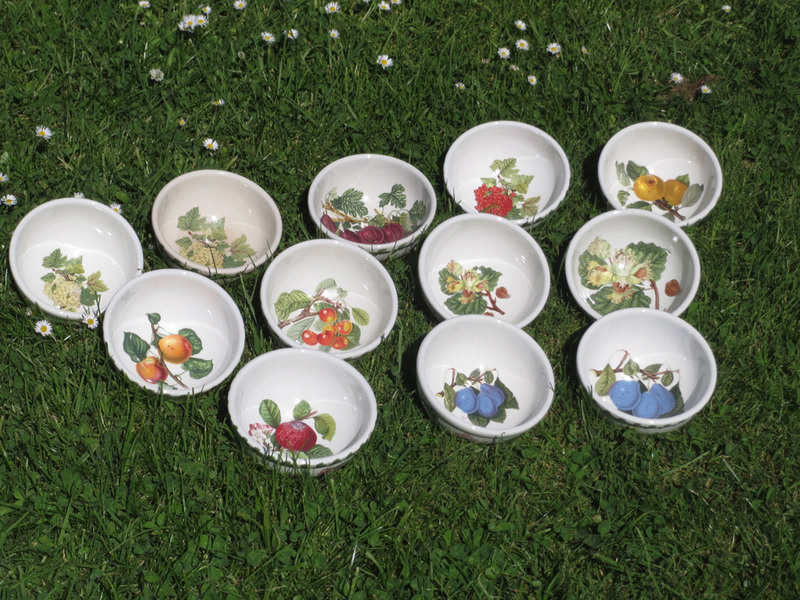 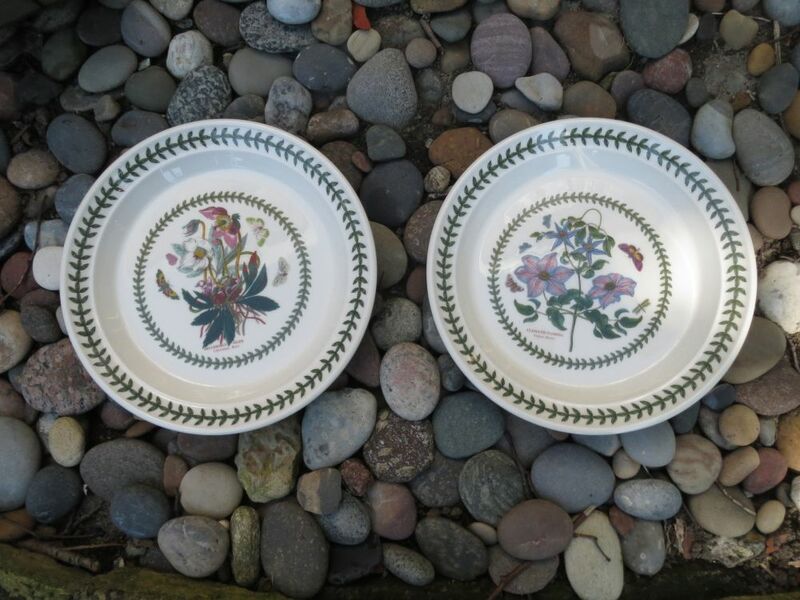 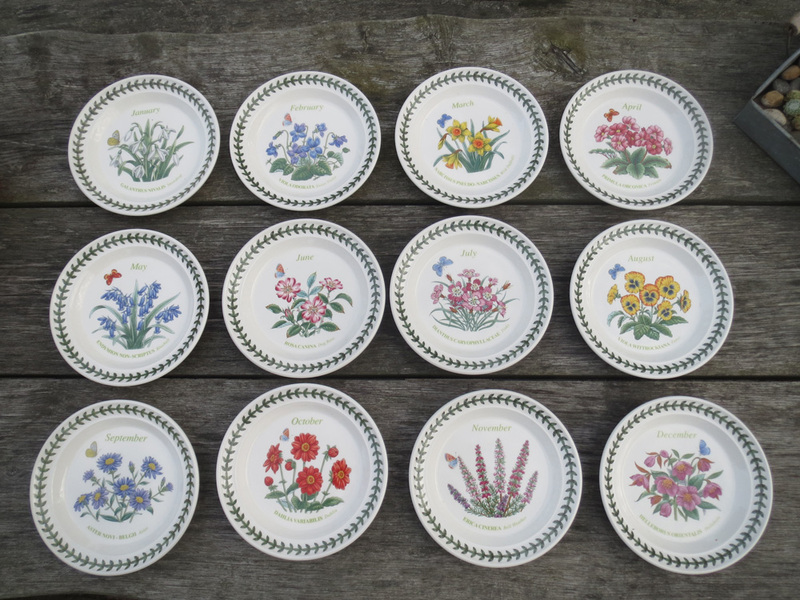 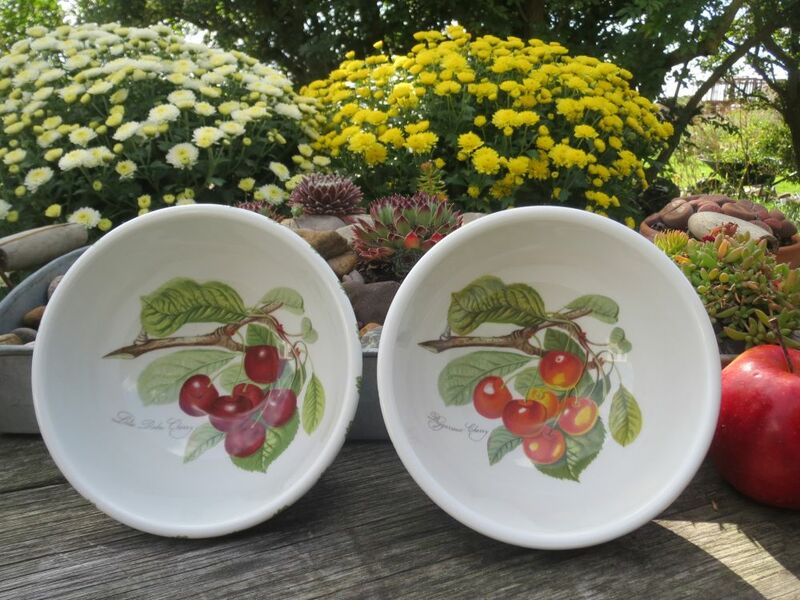 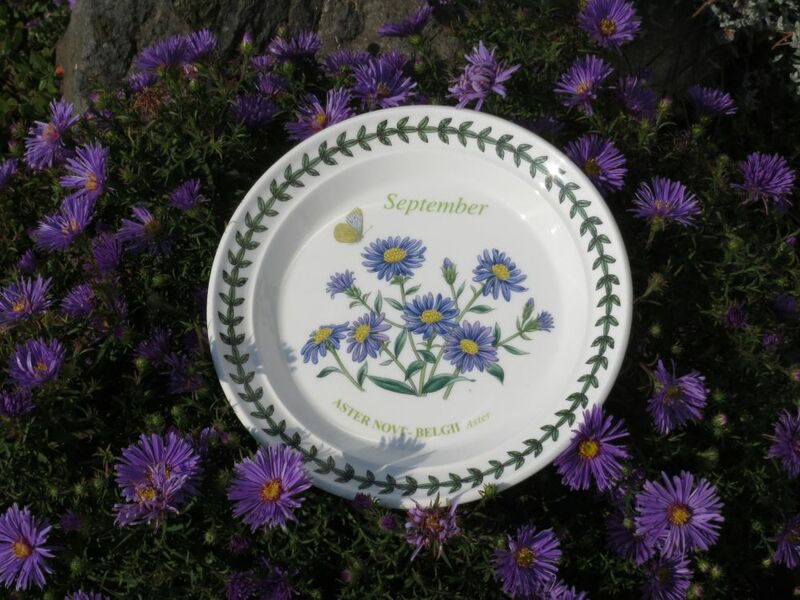 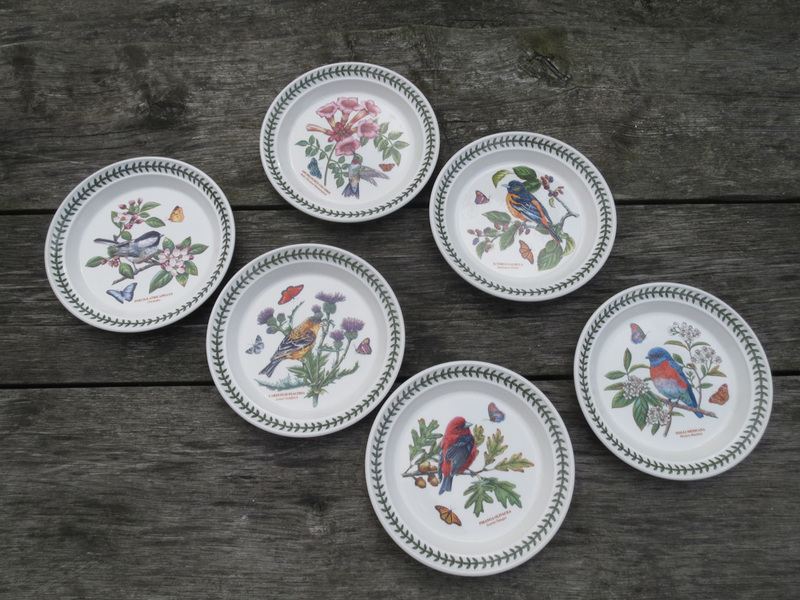 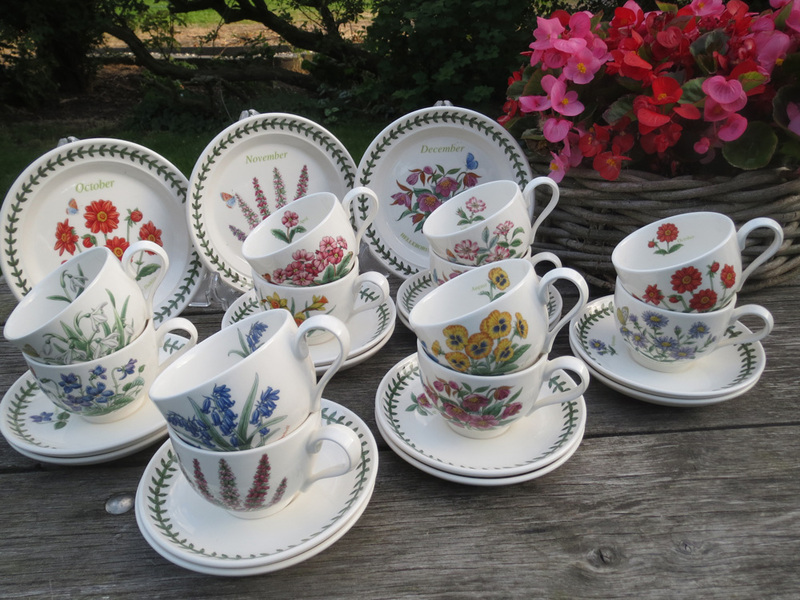 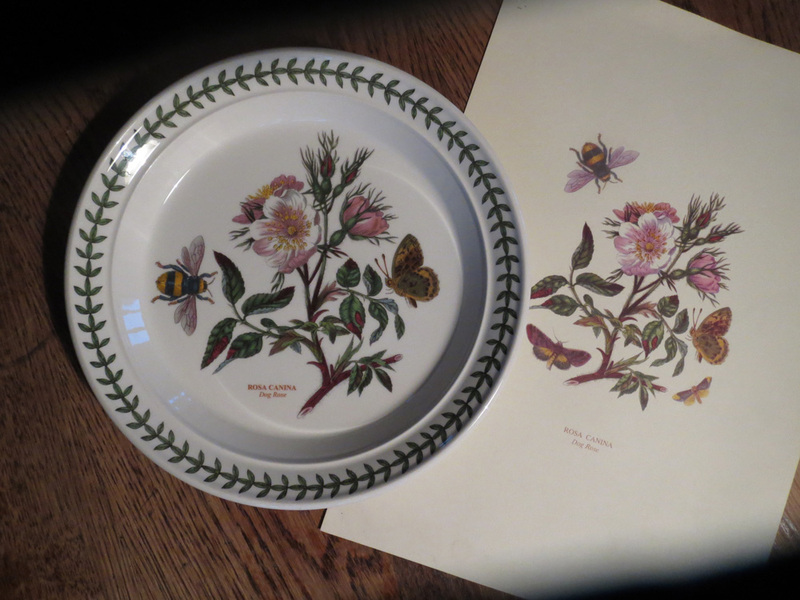 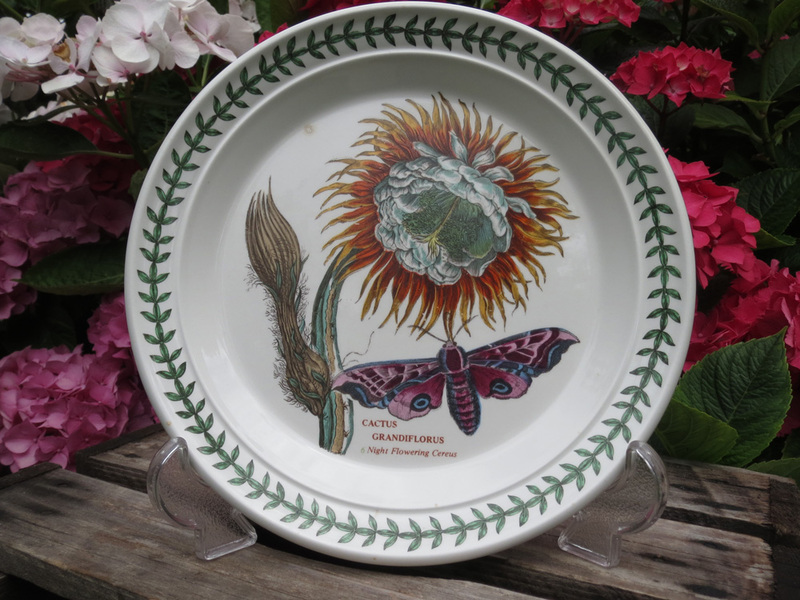 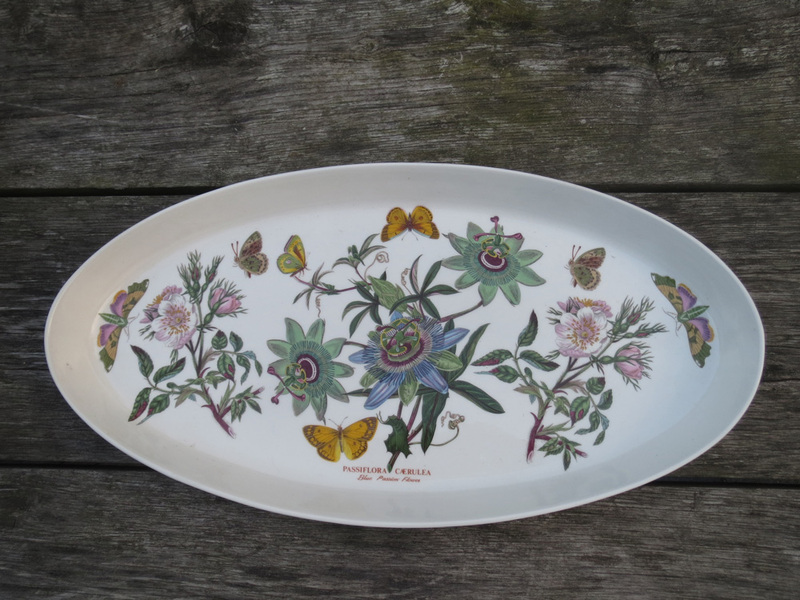 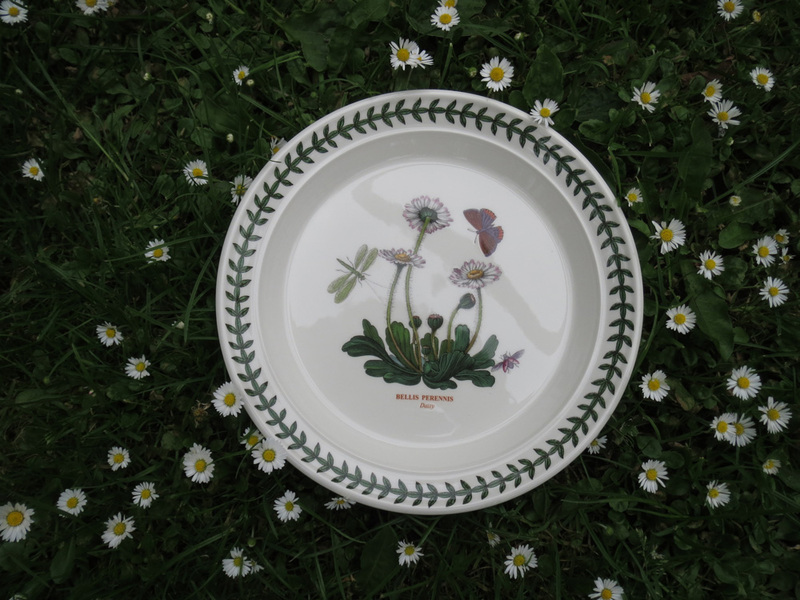 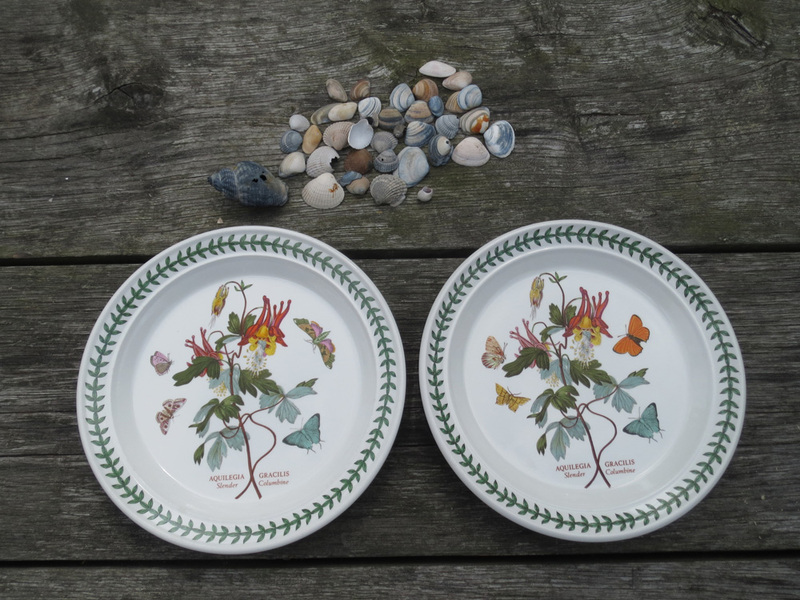 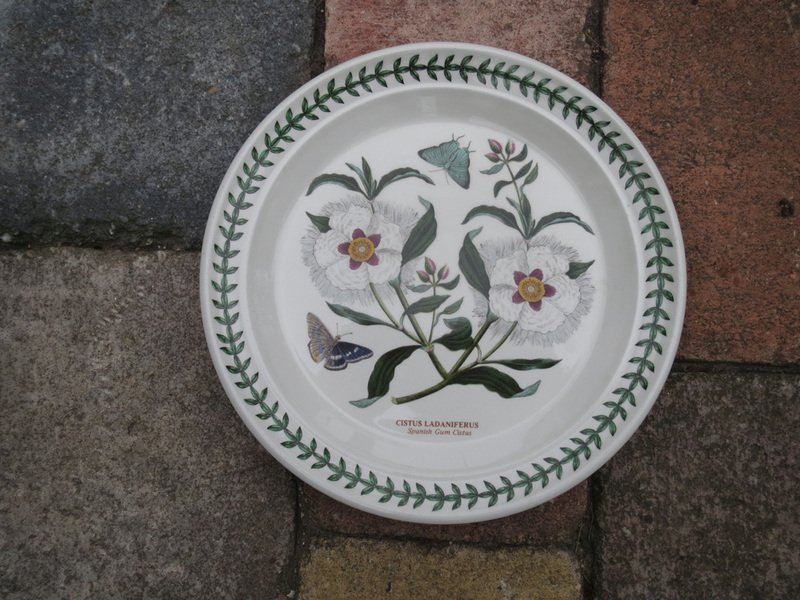 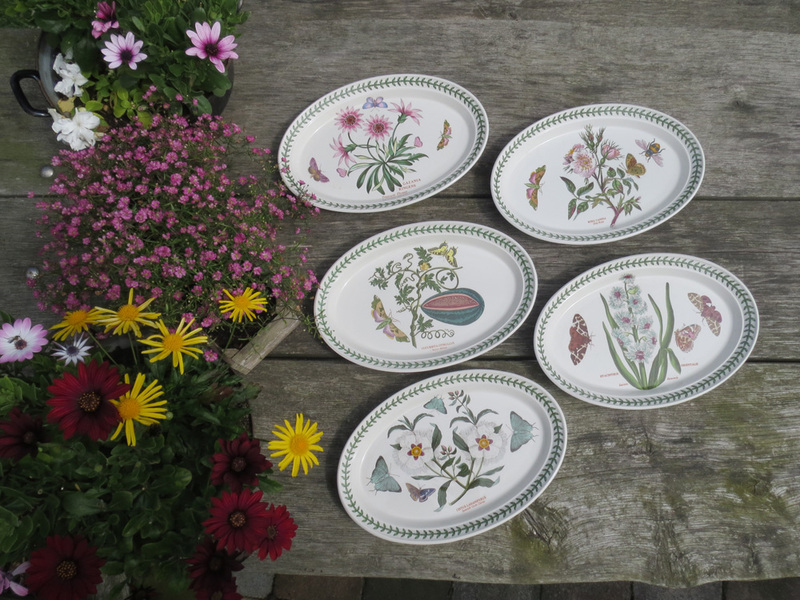 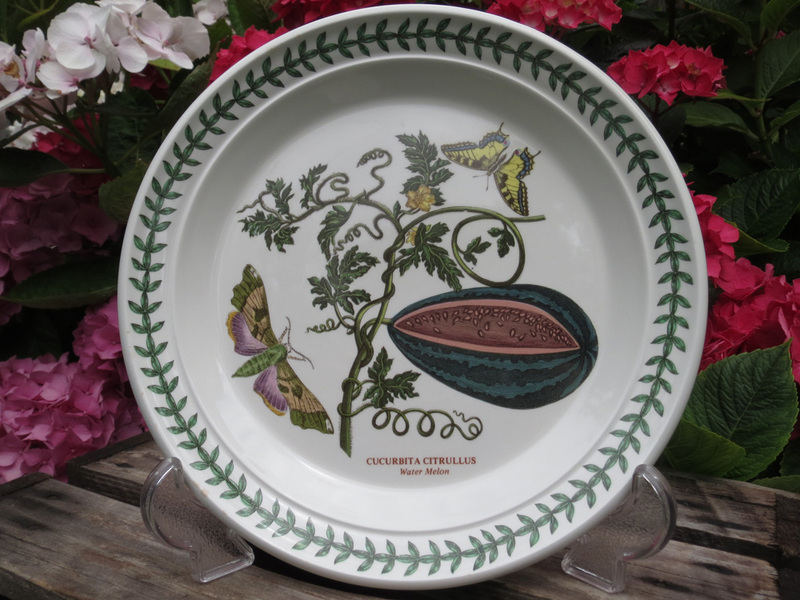 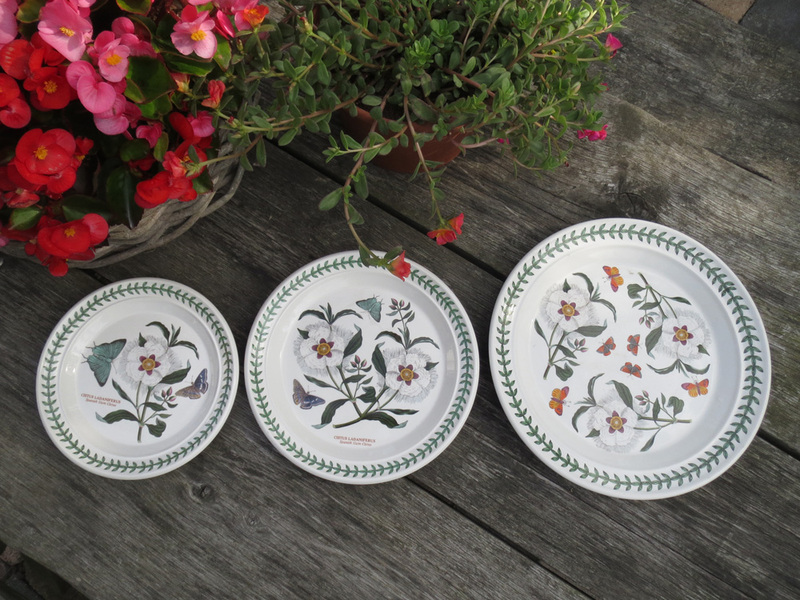 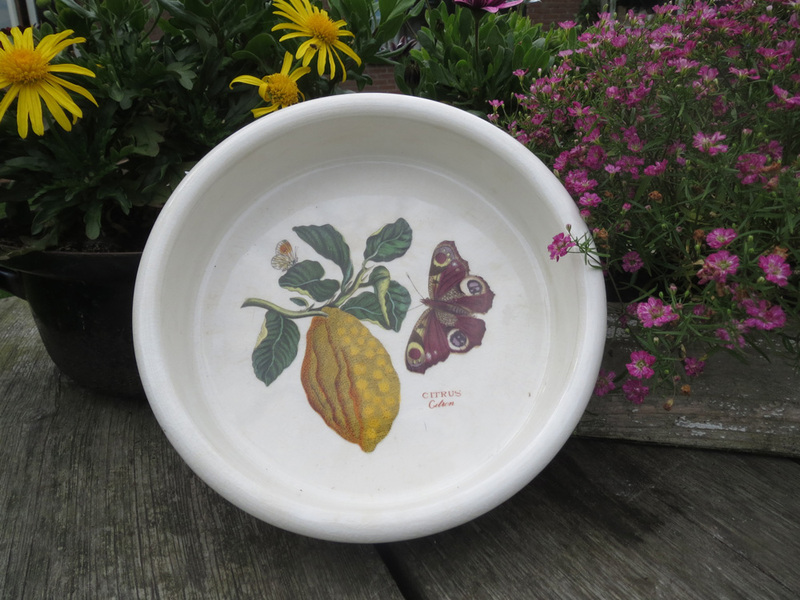 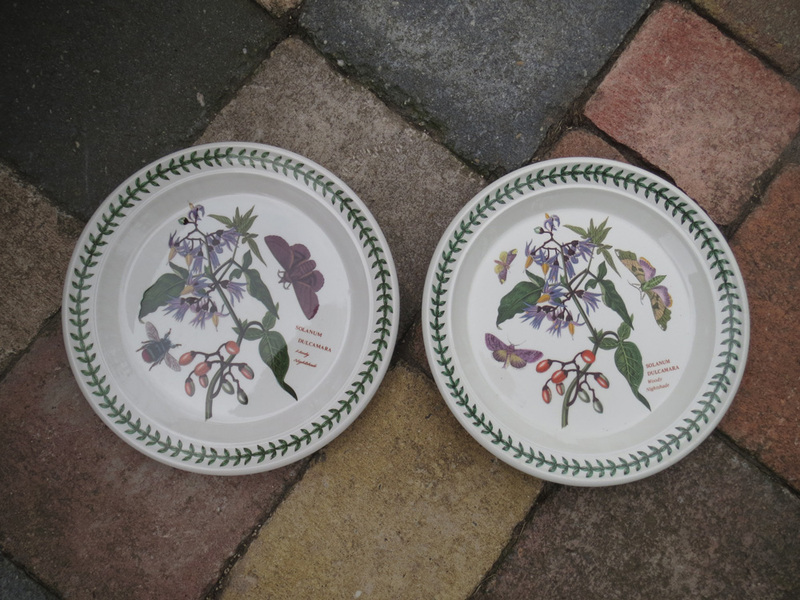 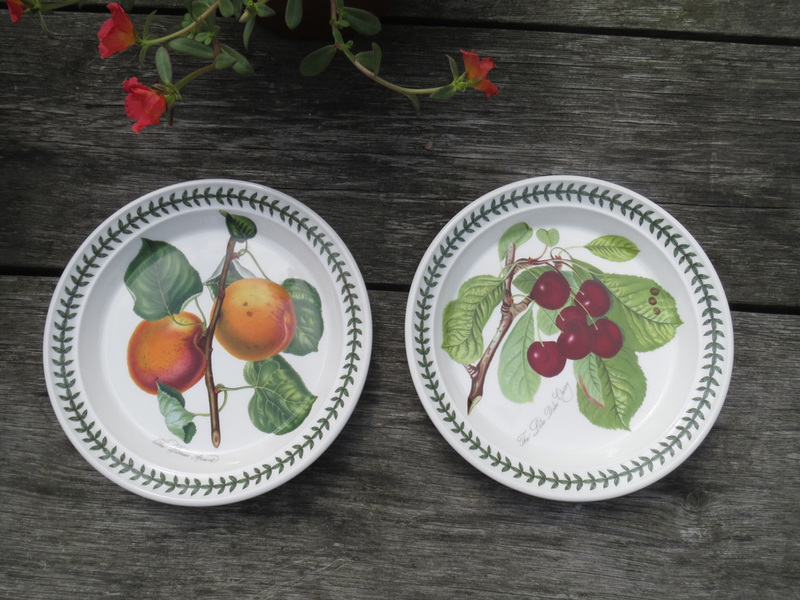 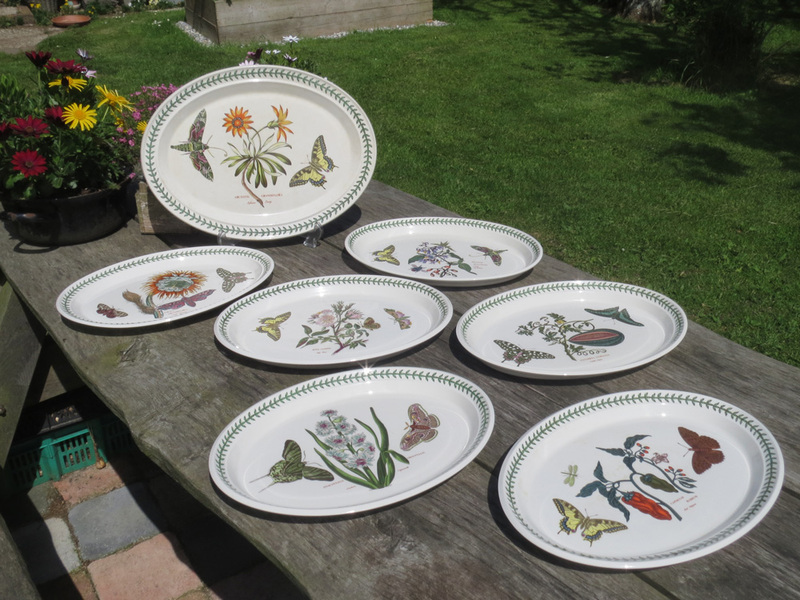 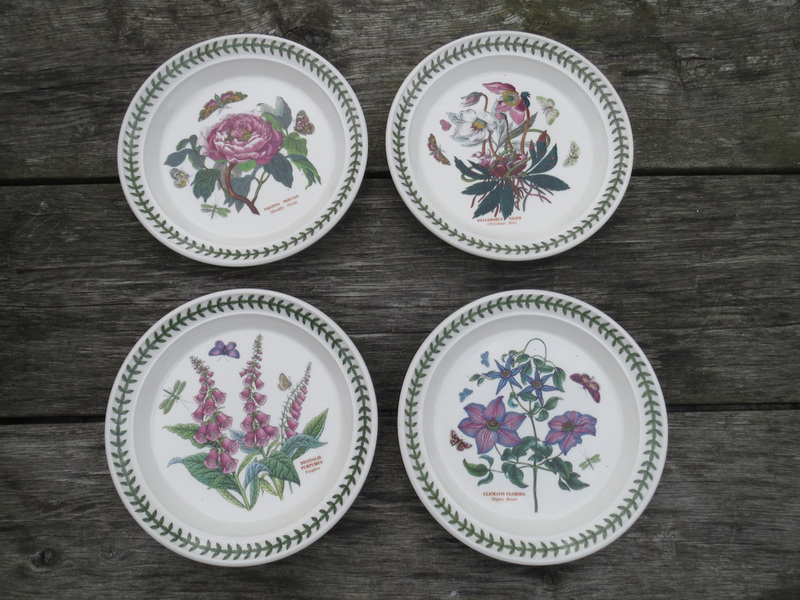 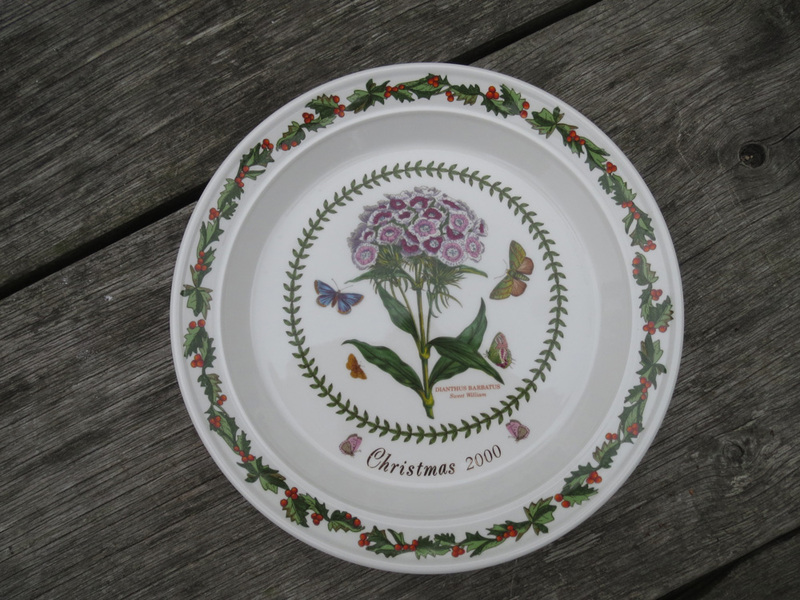 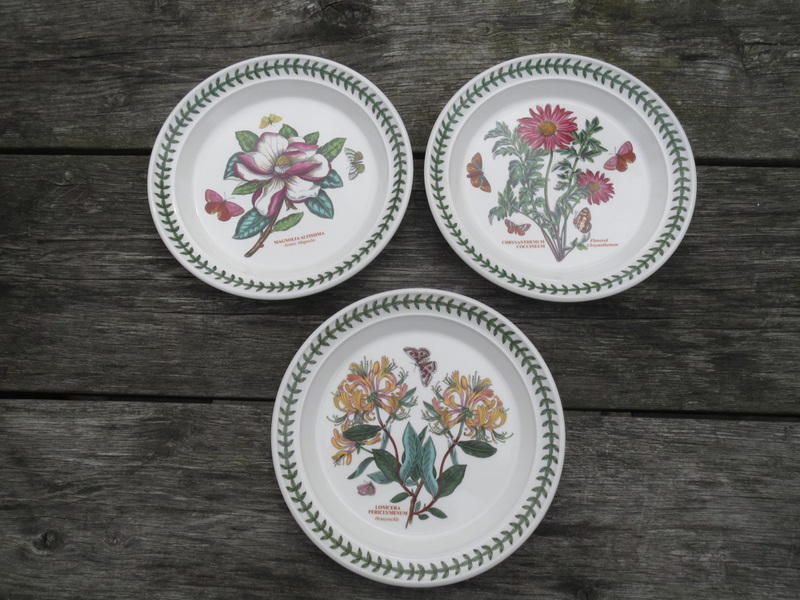 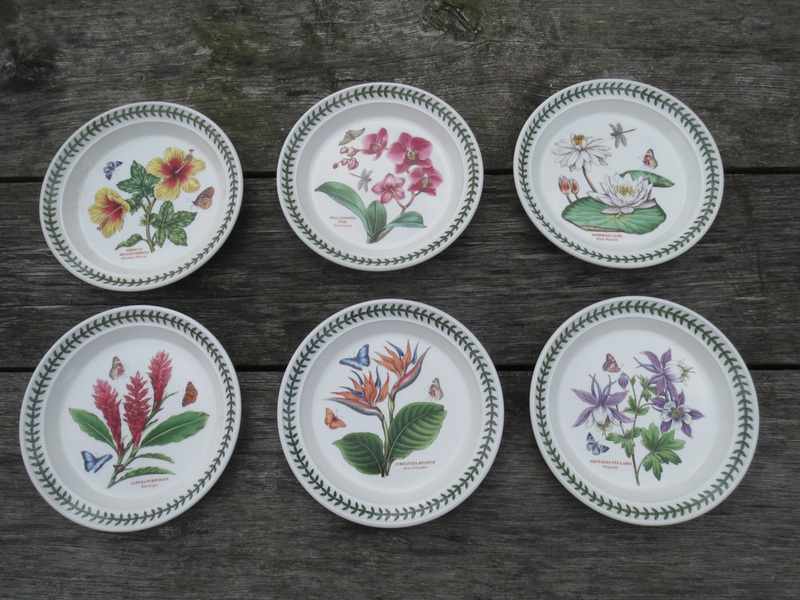 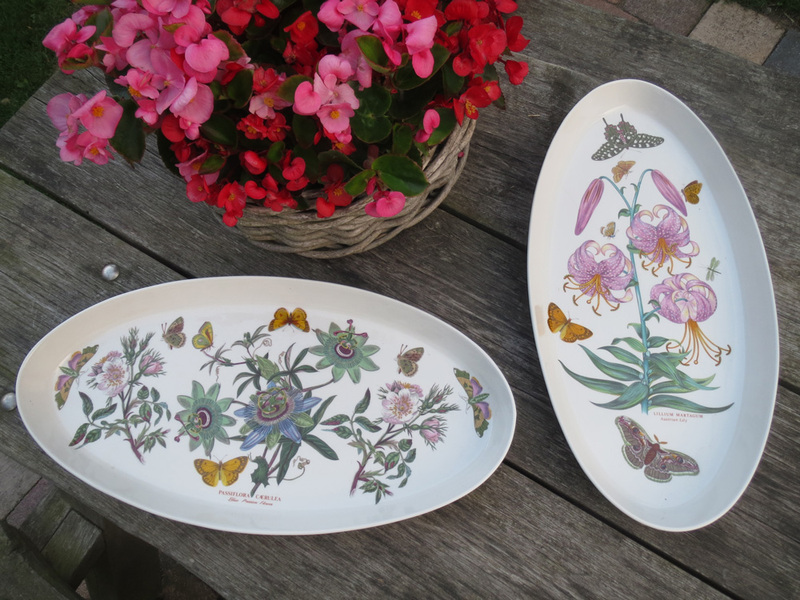 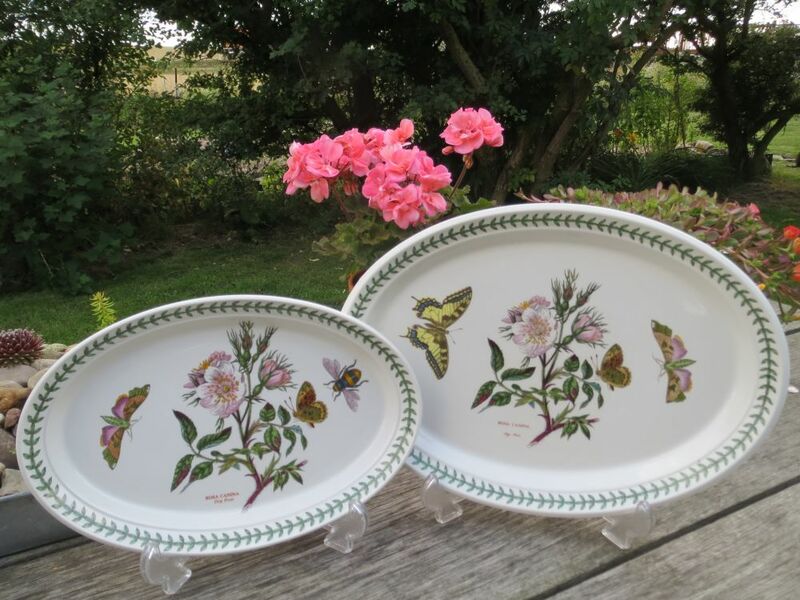 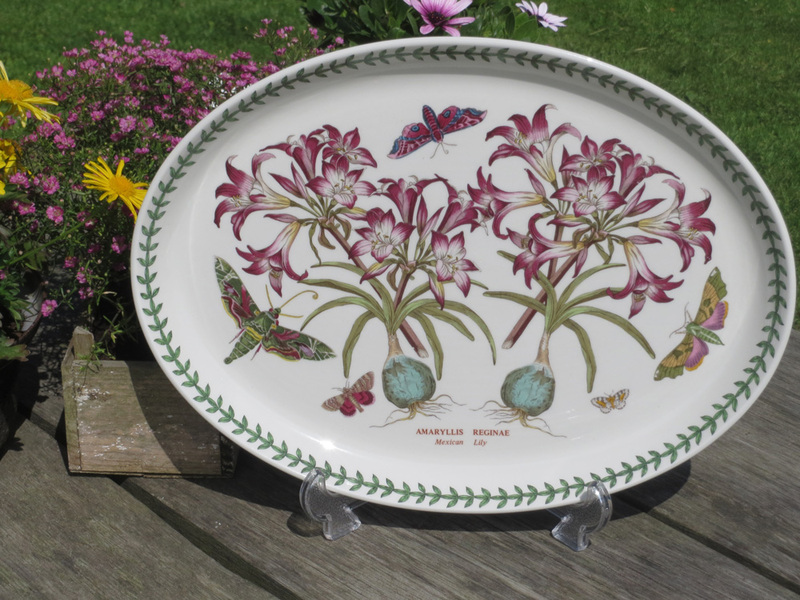 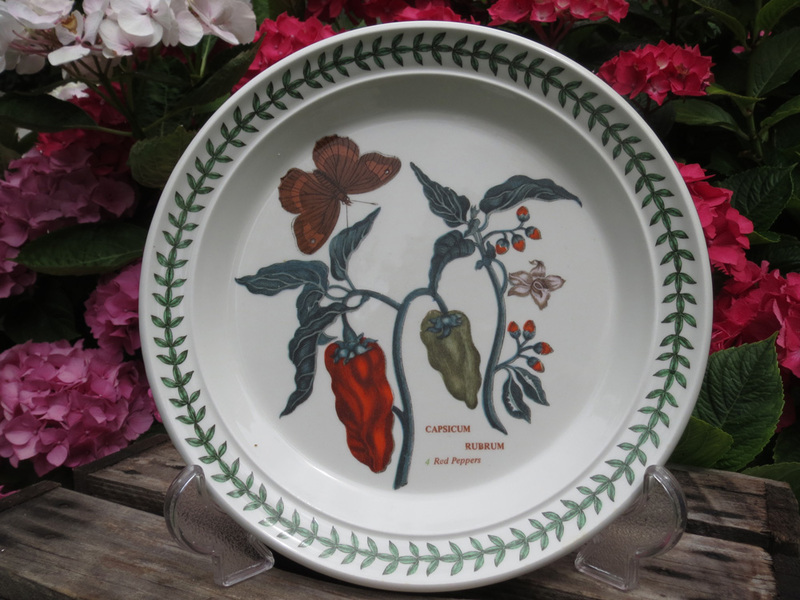 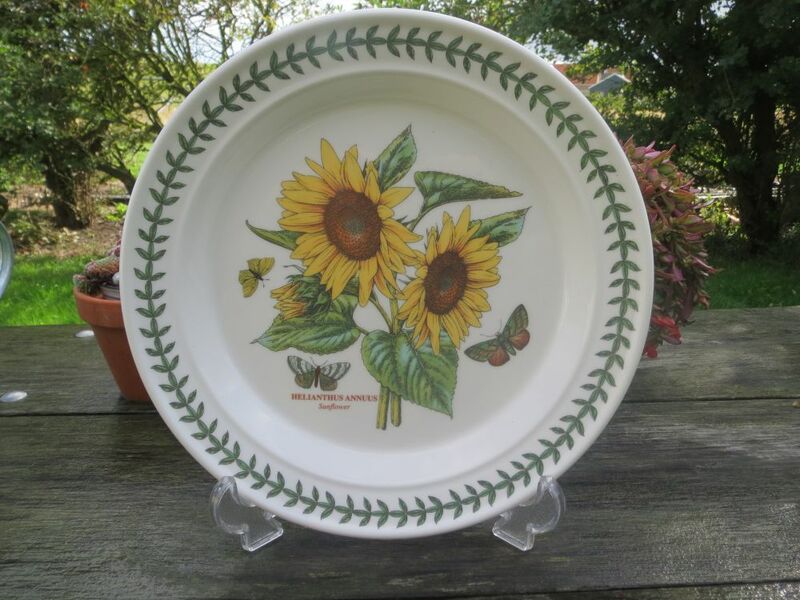 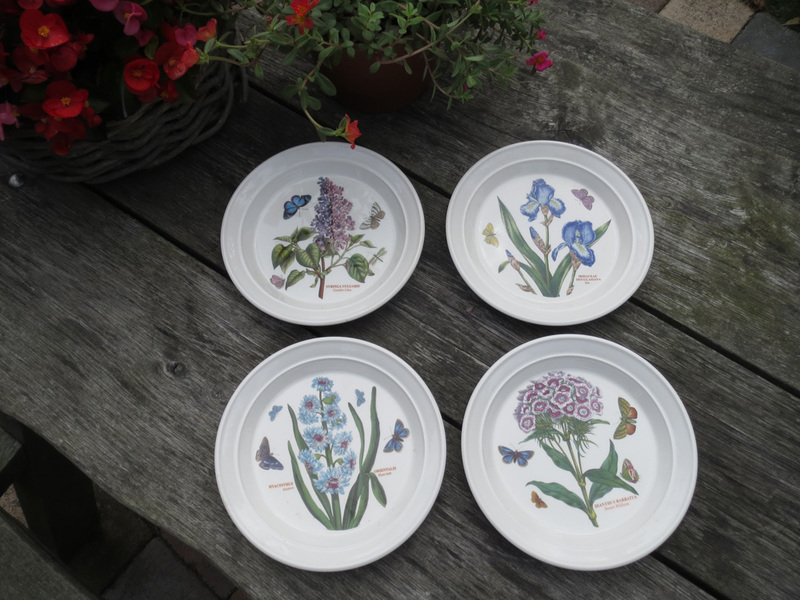 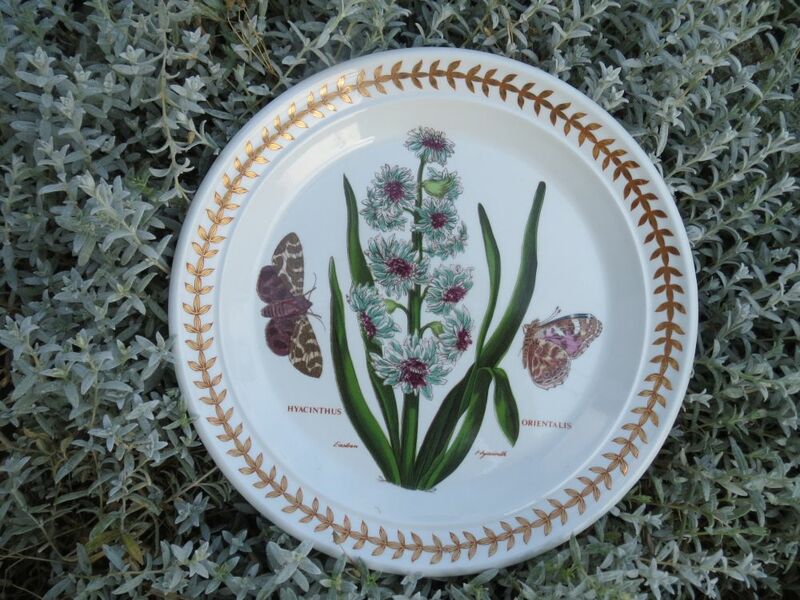 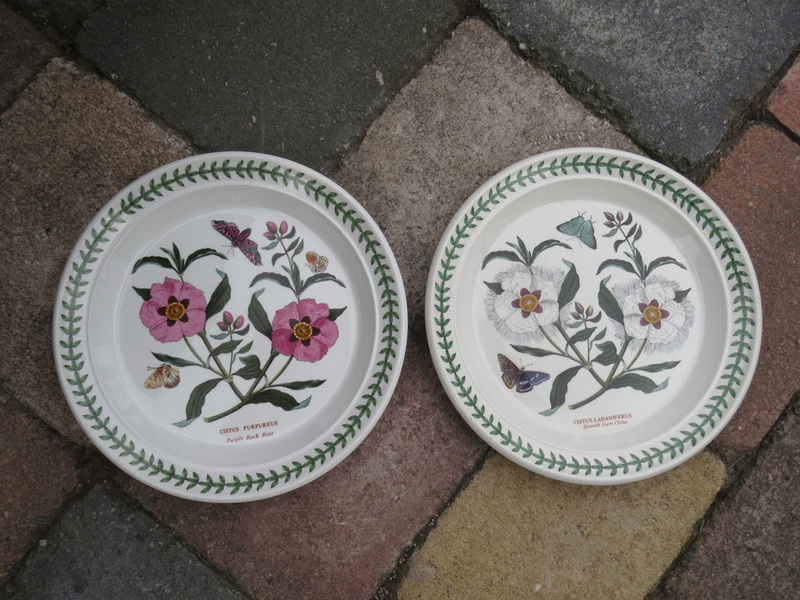 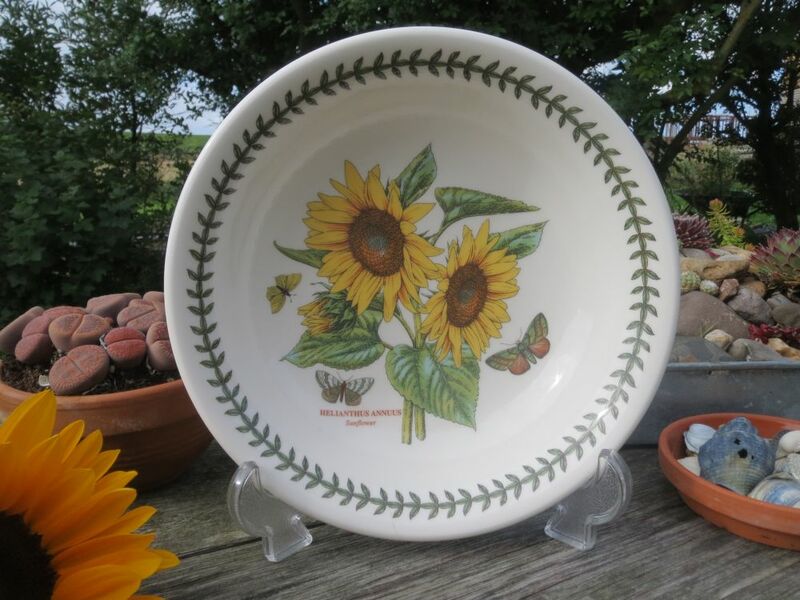 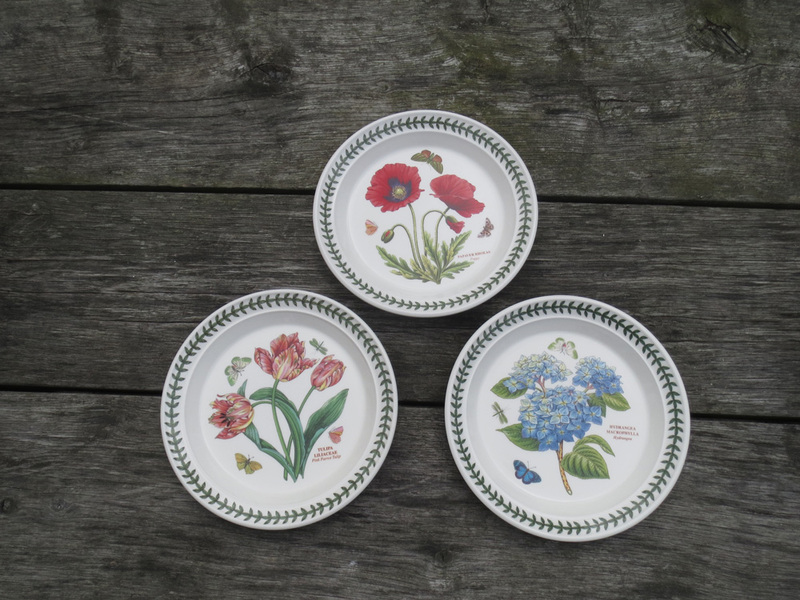 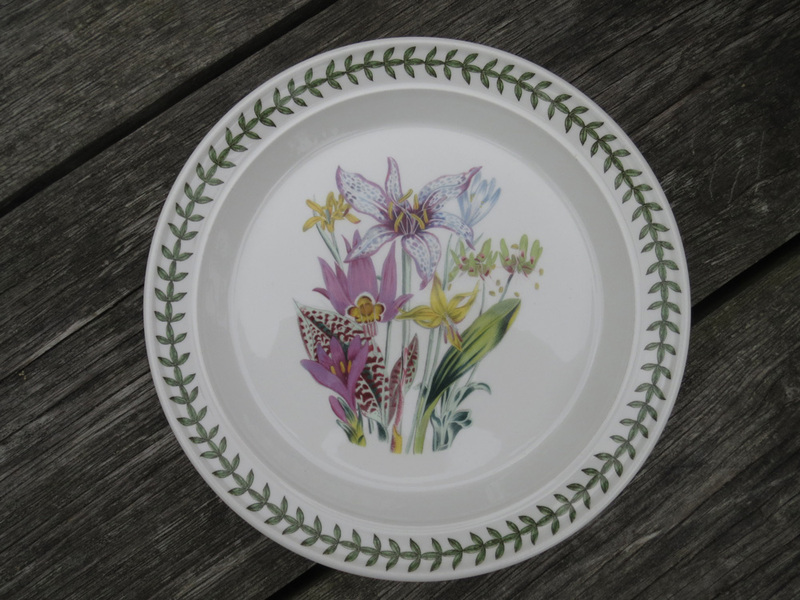 The motifs on the 13 inch platters were the same as on the first 8 inch salad plates: Woody Nightshade, Water Melon, Red Pepper, Night Flowering Cactus, Dog Rose and Eastern Hyacinth. 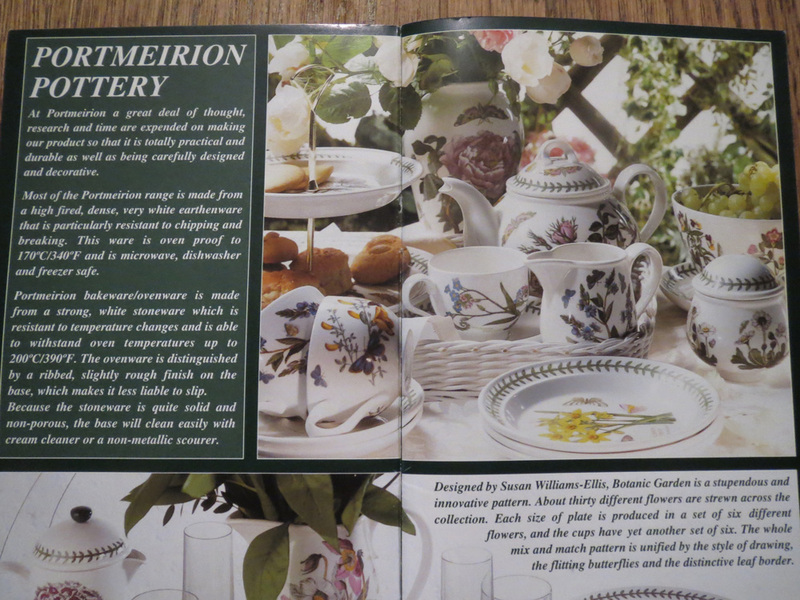 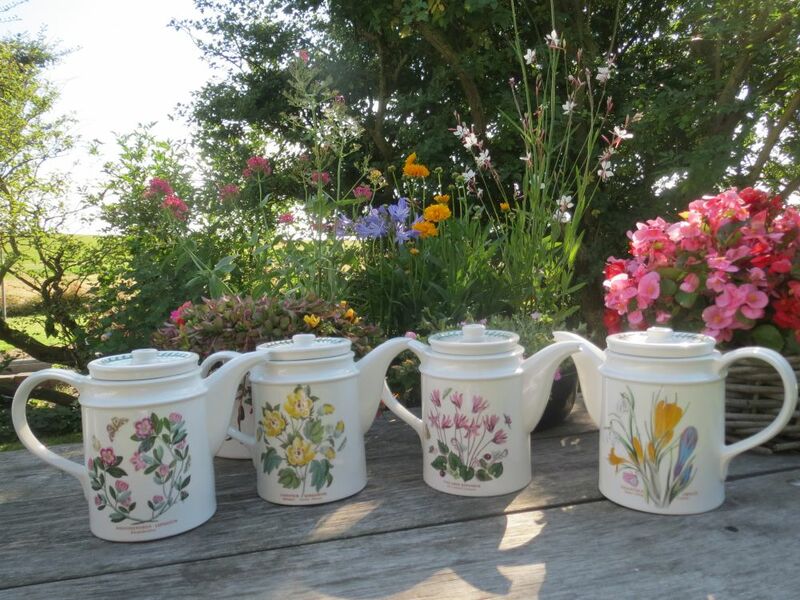 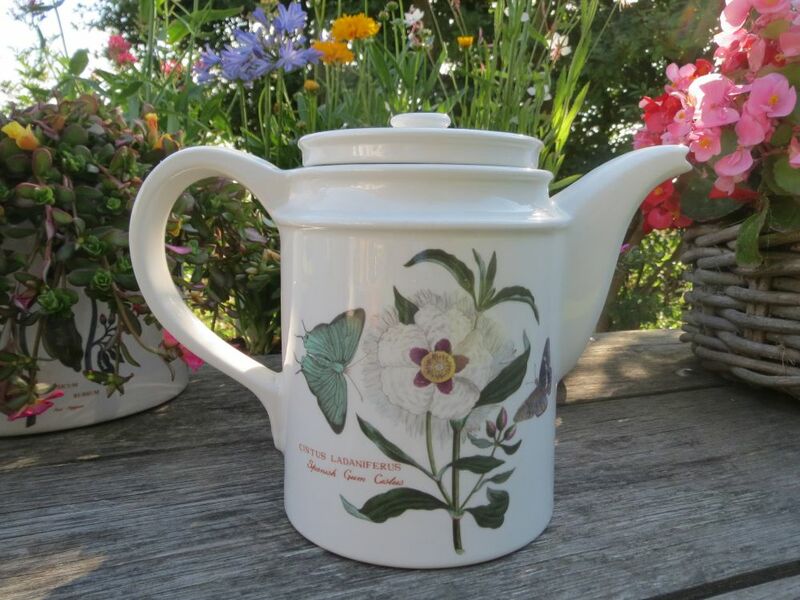 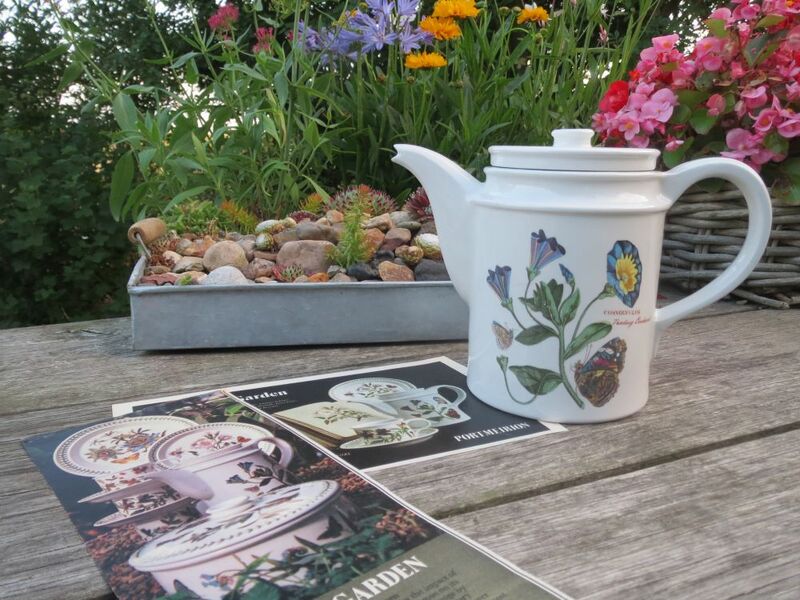 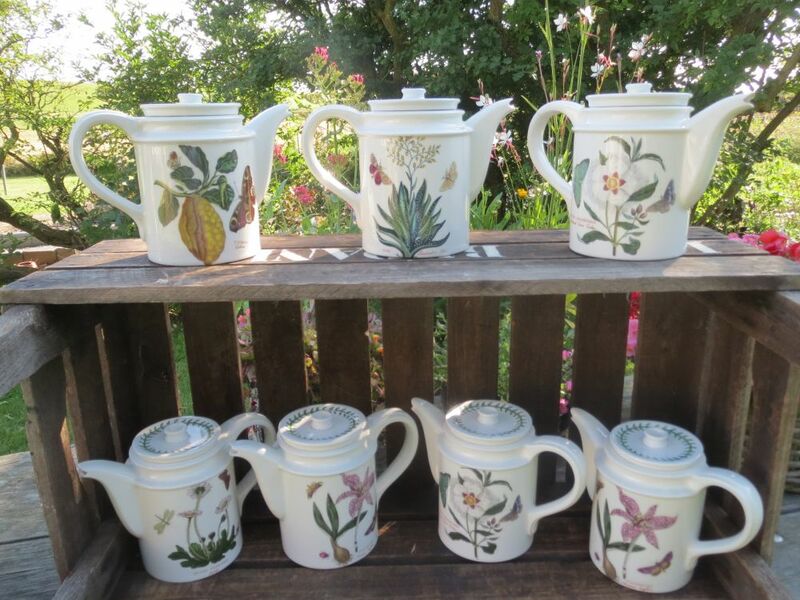 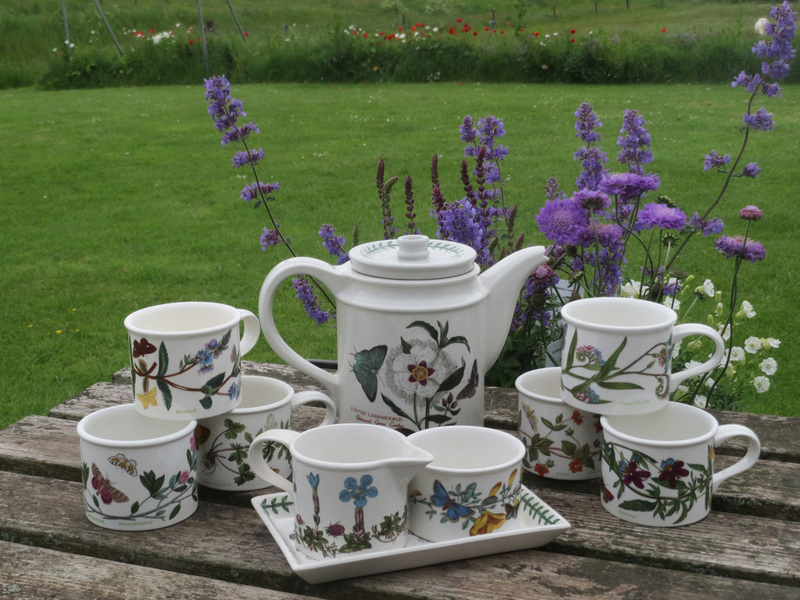 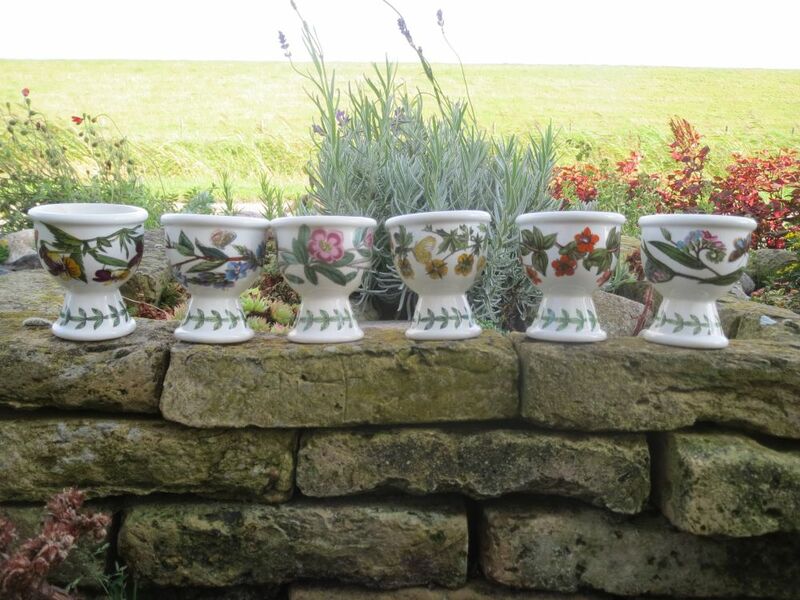 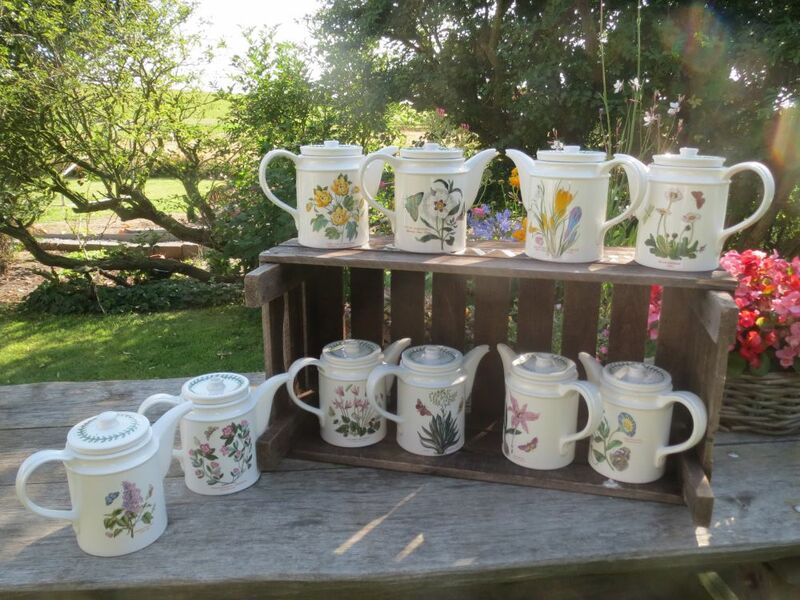 The motifs here are Treasure Flower, Dog Rose, Water Melon, Eastern Hyacinth and White Gum Cistus.